I keep thinking it’s Friday. Kyle has the rest of the week off for the holidays and I’m so excited for him to come over tonight. I know it’s only Wednesday, but I really do miss him during the week. It’s cheesy and I never say things like this on the blog, but it’s true:) We are going to finish up Christmas shopping together tomorrow, so I want to share a recap post before I get too far behind. 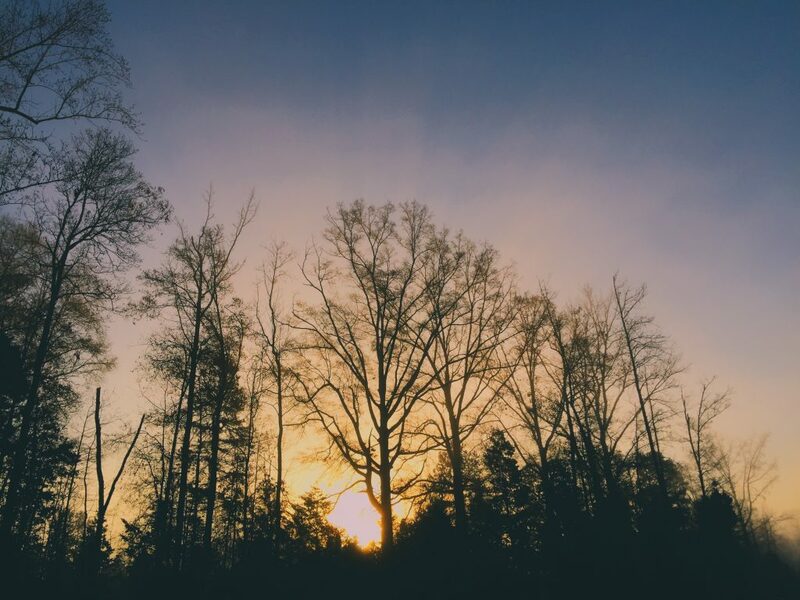 Even though it was 23 degrees this morning, it was still beautiful. It did somehow get up to 58 degrees later in the afternoon, which was nice! 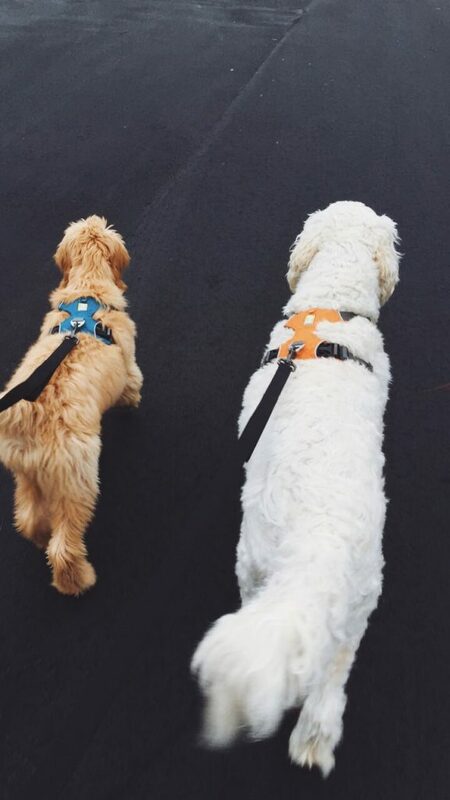 I woke up around six with the pups and took them on a mile walk. I forgot my gloves, so my hands were freezing by the time we got back. I would have gone several miles, but I kind of need my fingers to be a blogger. I took this photo of the sky from my front porch when I got back from the walk (after my hands thawed out.) There was a cold fog hovering the trees and it looked magical. The photo doesn’t do it justice. I turned the coffee pot on before my walk, so it was ready and hot by the time I got back. It helped thaw out my fingers! I can’t wait until spring so I can sit outside after my walks. My backyard looks out at the woods and its so peaceful. I worked more on my guest bathroom yesterday! Here is a sneak peek, but I have so much more to do! I’m still working on the new mirror, I have to put the chandelier up, and I need to get the shelves up! The shelves will have hand towels, personal products, tissues, and baskets on them. Im so glad that bright green is gone. When I was walking through the homes in the Fourth Ward for the Christmas tour, I saw one of the ceilings had wallpaper with a chandelier and I’m contemplating on doing the same with this bathroom. I had one of the best salads for dinner. I want to make this again and again! I was trying to use up all the produce in the house before the holidays, so this random salad ended up being one of my favorite combos. 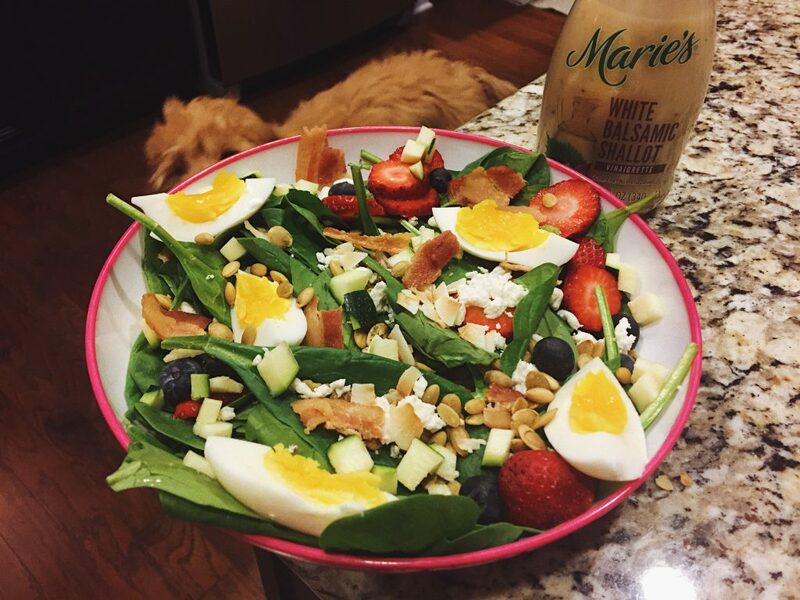 This salad had fresh spinach leaves, sliced strawberries, blueberries, diced zucchini, pepitas, goat cheese, unsweetened toasted coconut flakes, bacon, and soft boiled eggs. I used my new favorite dressing, white balsamic shallot vinaigrette. 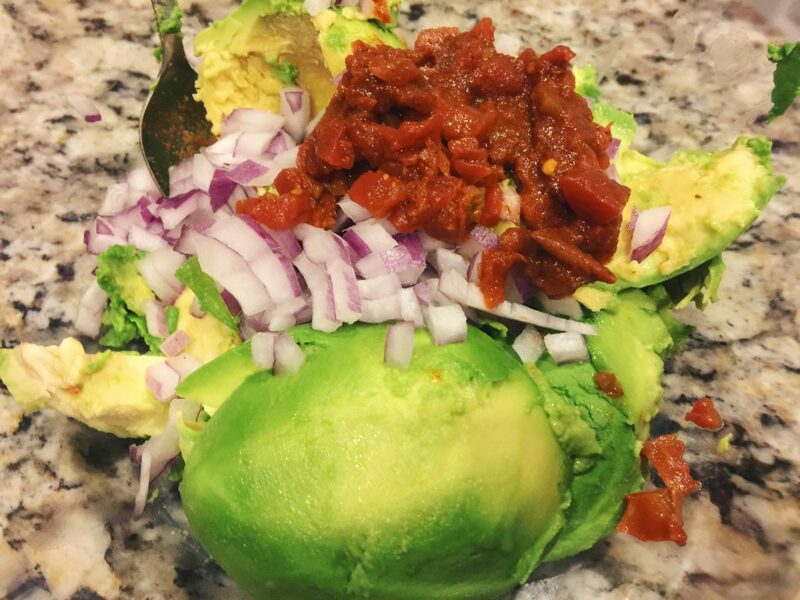 If you’re bored with the dressing you’ve been using, definitely try this one out! It’s sold in the produce section at the grocery store. It is literally restaurant style. Let’s go all the way back to last Monday! 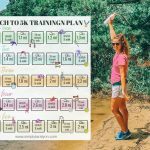 I’m sticking to my half marathon training, but I’m not pushing myself too hard! I’m trying to do it the right way this time. I’ve been following the Hal Higdons training plan. I ran for a half hour in the neighborhood and then came inside for a 30 minutes strength training workout. I bought new dumbbell set for my living room, so I have no excuses! 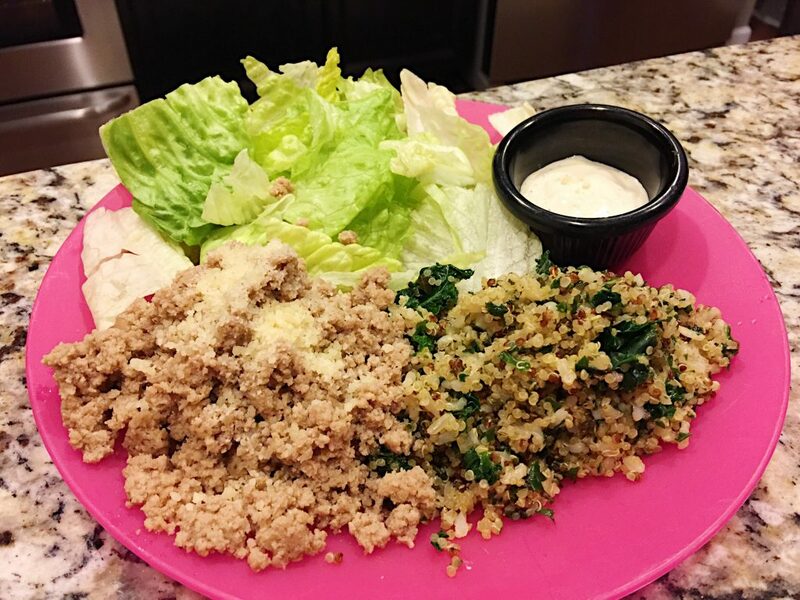 On Monday night, I had ground turkey with parmesan, quinoa with kale, and a side Caesar salad. I woke up early on Tuesday so I could head over to my parents and help my dad with a couple gifts. 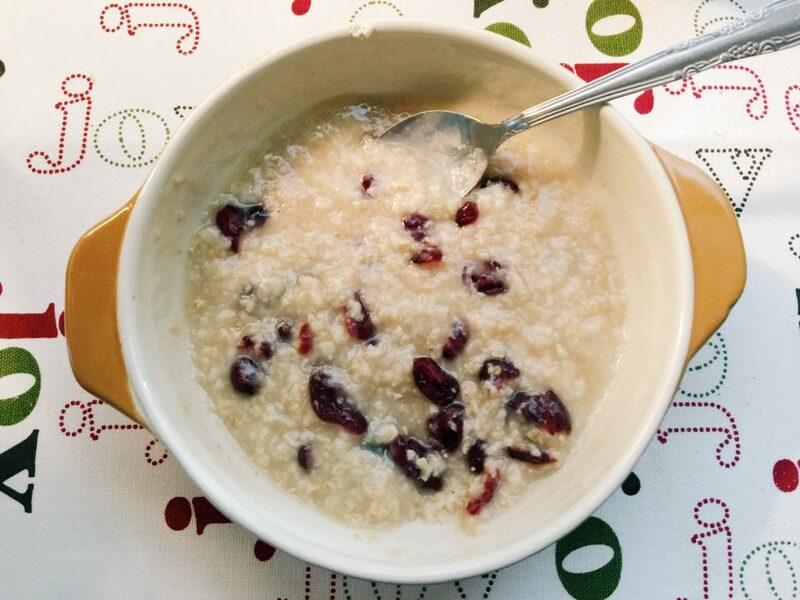 I had cinnamon cranberry oatmeal for breakfast 🙂 I love letting the dogs run around their backyard, and they especially loved it because it was rainy. The muddy boys had to take a bath. The dogs love driving out in the country. Grumples is obsessed with cows and he gets so excited when he sees them. He starts crying and jumping around. Sometimes I put him in the car and we just go for a cow ride for the fun of it. 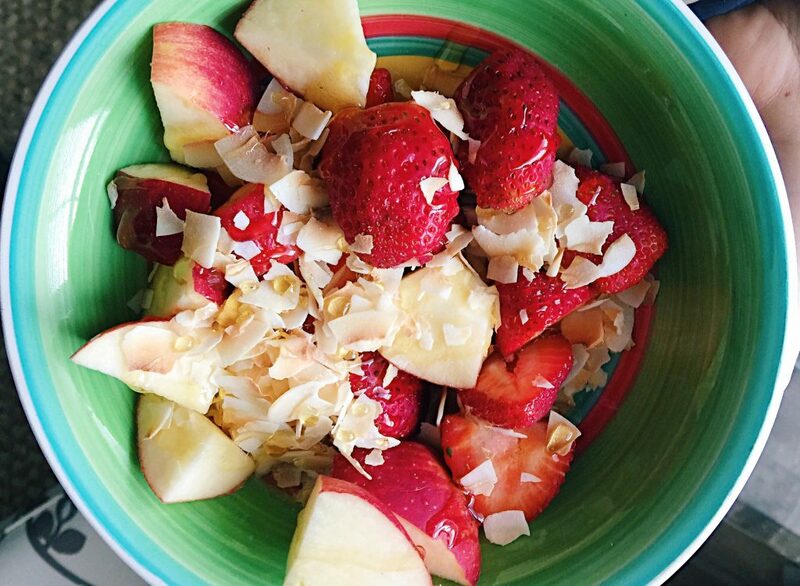 My afternoon snack had apples, strawberries, honey, and unsweetened toasted coconut! 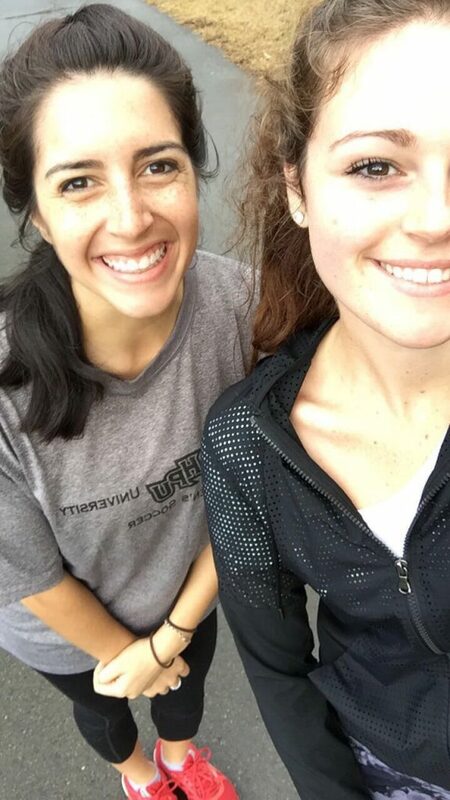 Meighan came over on Tuesday night for a run! We ran around my neighborhood and then came back for dinner. 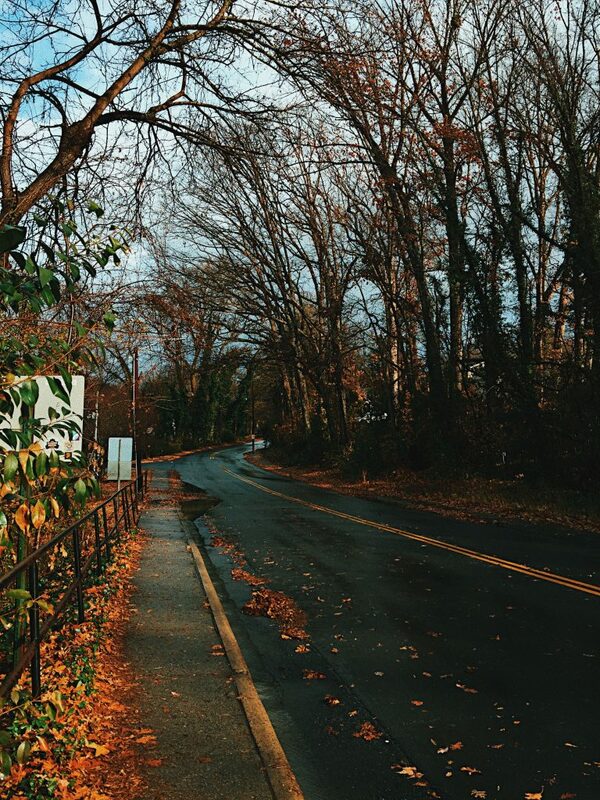 I love my neighborhood because it has hills and flat streets. 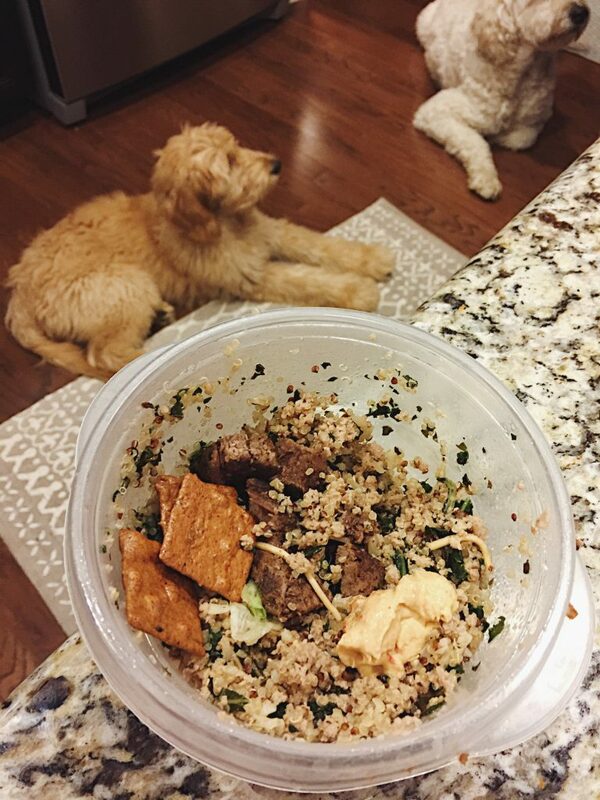 My dinner bowl had leftover quinoa with kale, steak, gluten free crackers, hummus and a sprinkle of cheese. I headed uptown on Wednesday night to go for a walk with Meighan. I love how festive uptown is during the holidays. I was so hungry when we were done with our walk. I stopped and picked up a green juice to hold me over before dinner. 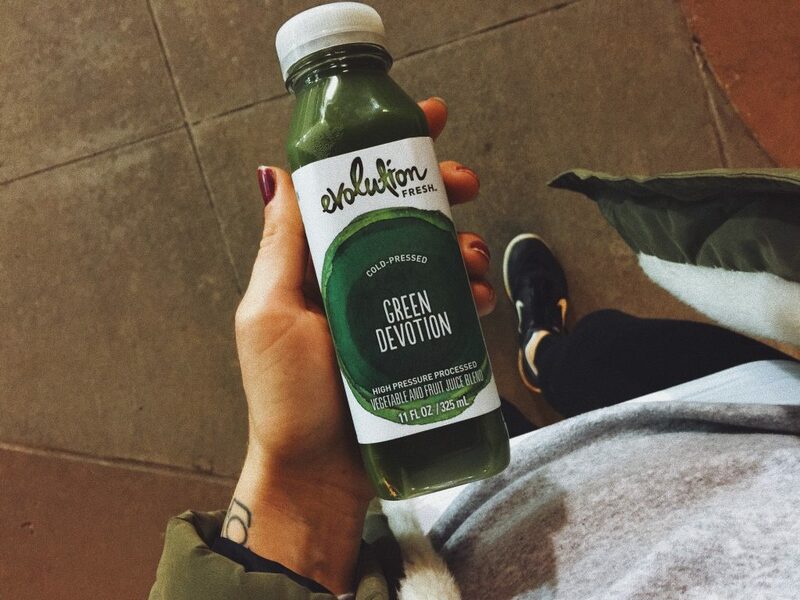 I like the green juices that don’t have a lot of fruit. They don’t necessarily taste great, but they are so much better for you and lower in sugar. I picked up a salad for dinner because it was late. 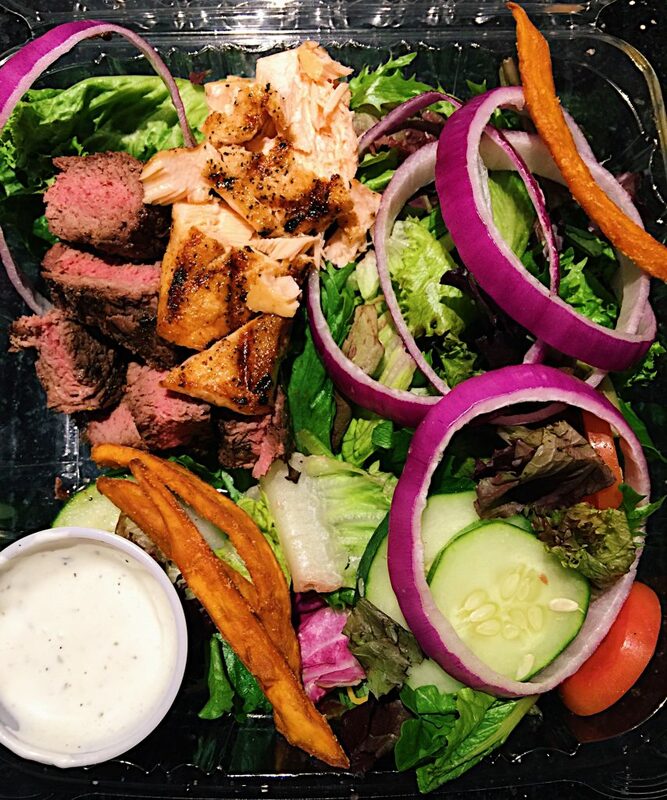 I had a half salmon/half steak salad with sweet potato fries. 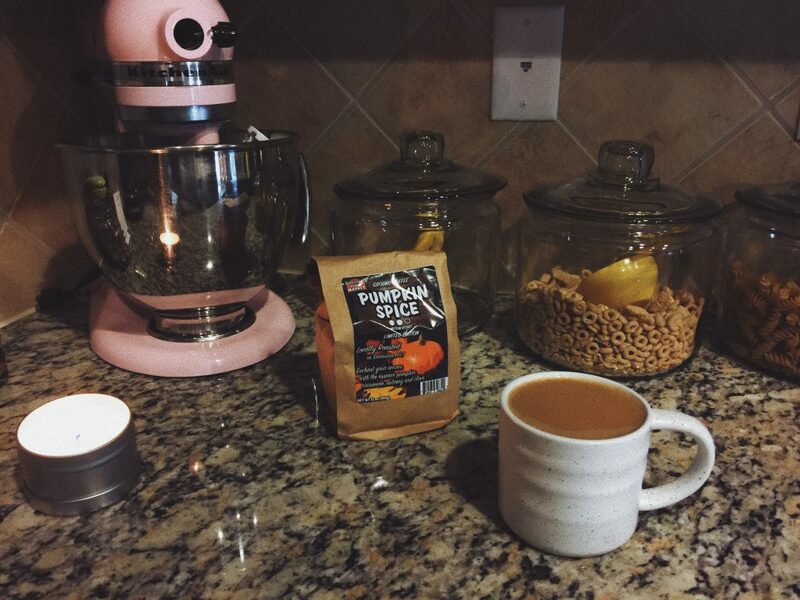 I had my pumpkin spice coffee that Kyle’s mom got me. It’s really good 🙂 I do half dark roast and half pumpkin spice! The boys were so cozy. They fight for that spot! 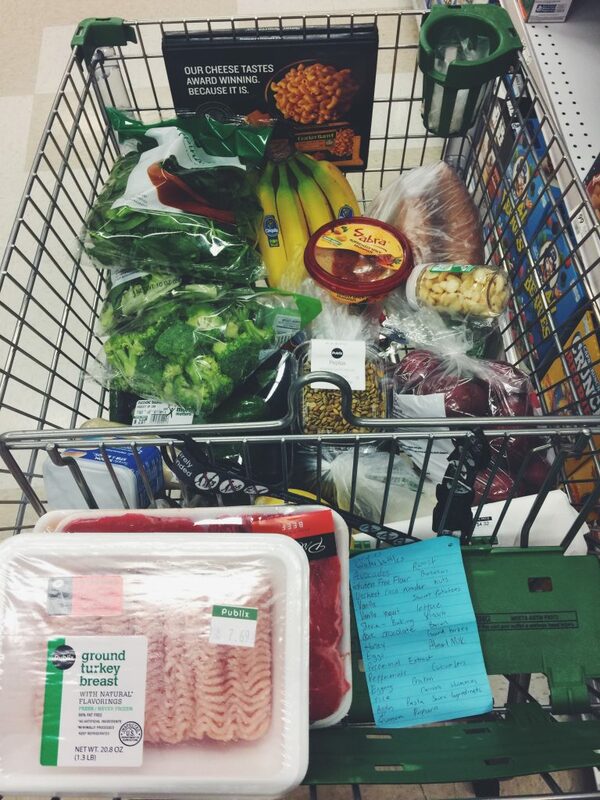 I made a list and headed to the grocery store on Thursday night. I bought SO MUCH FOOD! It was the first time filling up the fridge since moving in. Buying all of that food has forced me to eat and home and avoid dining out. I’ve gone out to eat maybe twice this month! 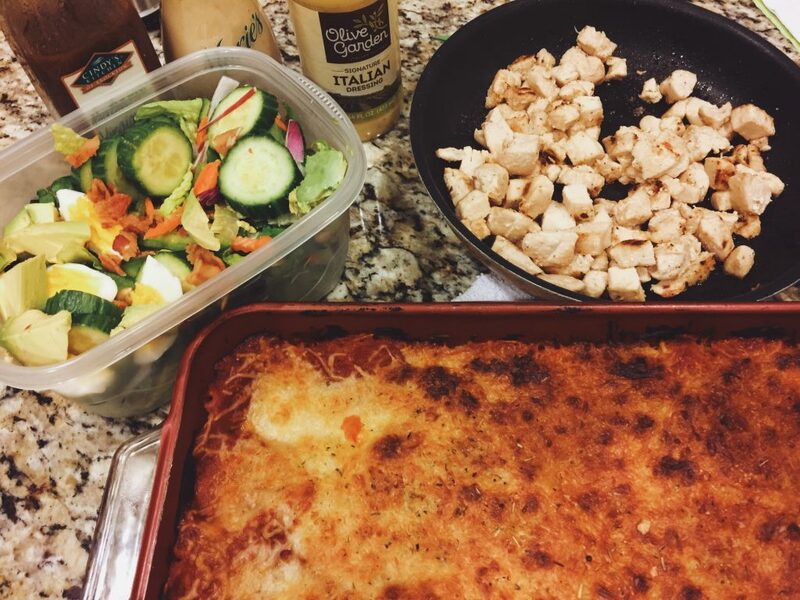 That is a big difference for me and I plan on sticking to home cooking. The cart was overflowing by the time I was ready to checkout. 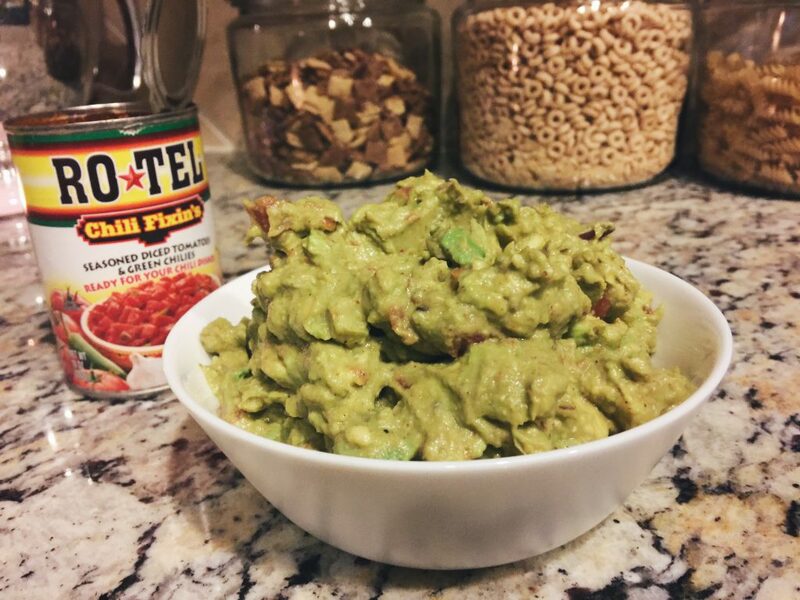 This guacamcole had three avocados, 1/3 cup fiesta green chilies rotel, 1/4 cup chopped red onion, 1 tsp garlic powder, 1 tsp onion powder, sprinkle of black pepper, sea salt, and 1/4 teaspoon cayenne pepper. It was so good with carrots and supremely spicy hummus. 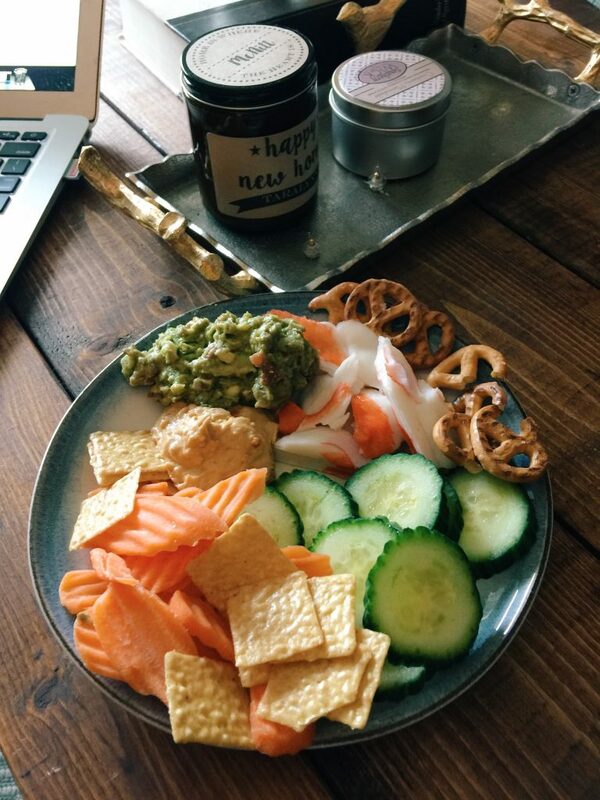 Friday’s lunch had gluten free crackers, carrots, gluten free pretzels, cucumber, guacamole, and hummus! I was in pure muffin mode on Friday! 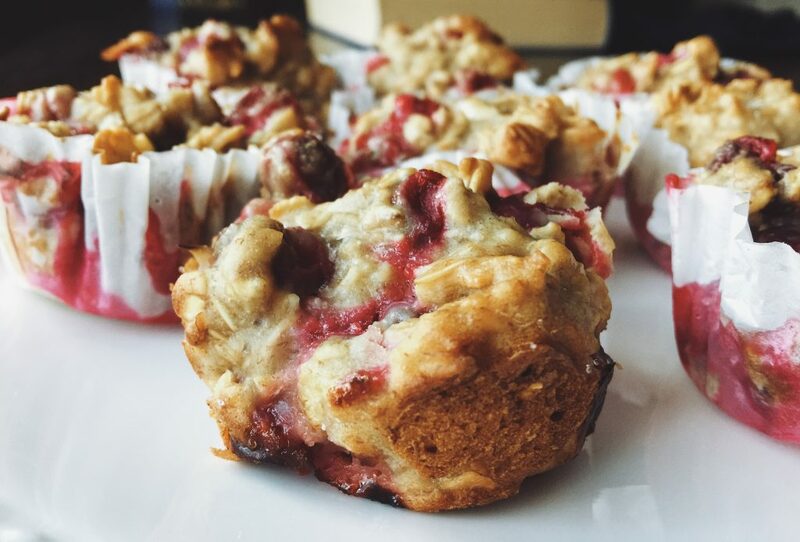 I made these gluten free cranberry banana oat muffins. 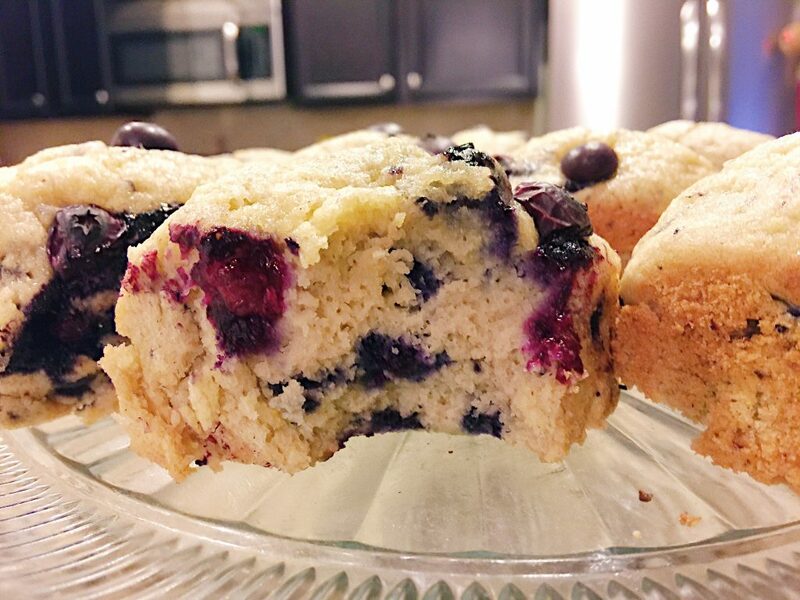 I also made almond flour blueberry muffins! Kyle came over on Friday night and we watched Christmas movies! 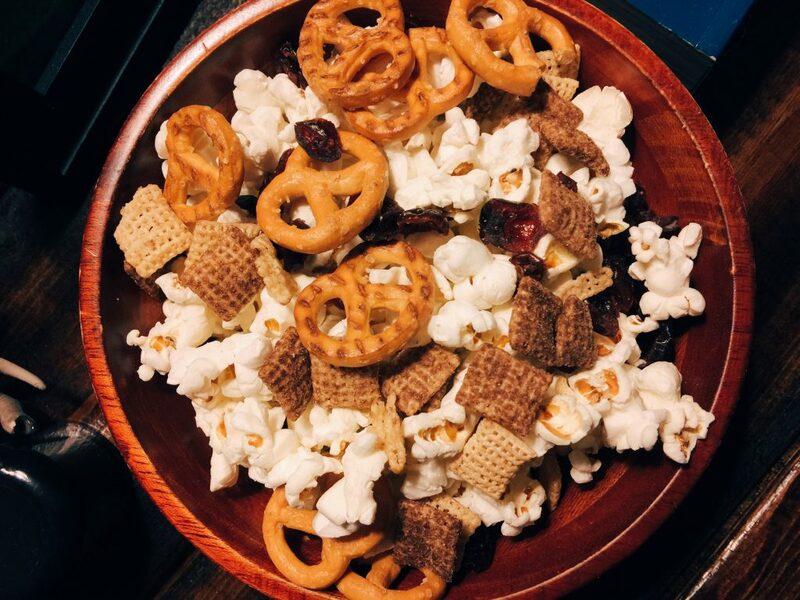 My popcorn bowl had chocolate Chex, gluten free pretzels, skinny pop popcorn and dried cranberries. The only thing it was missing was roasted almonds! I don’t stay up for movies, ever! 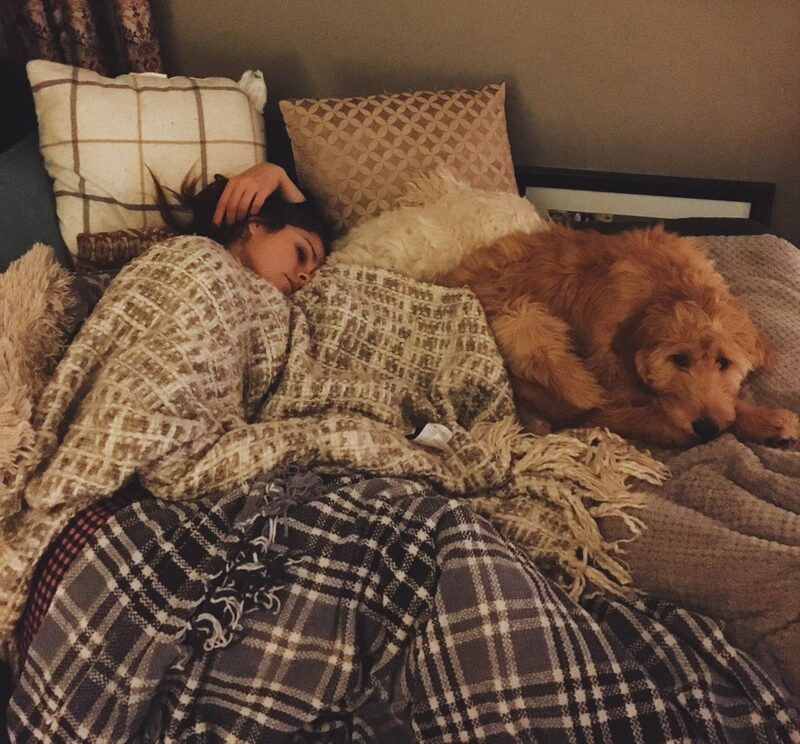 Kyle is famous for always taking my photos while I sleep (in a non creepy way) I really liked this photo because I was sound asleep with both of the pups! You can kind of see Grumples little head popping up! 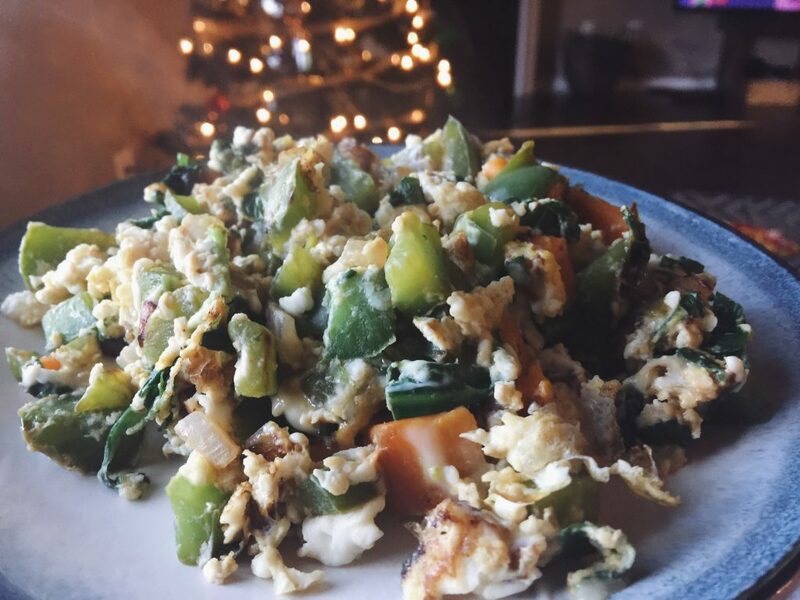 I had my favorite egg scramble for breakfast. 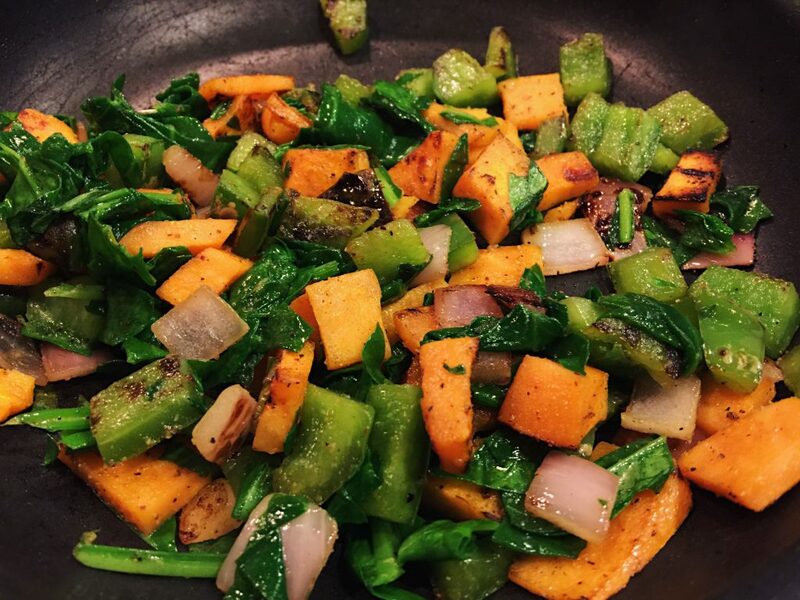 I sautéed peppers, onions, and spinach together with a little bit of olive oil. 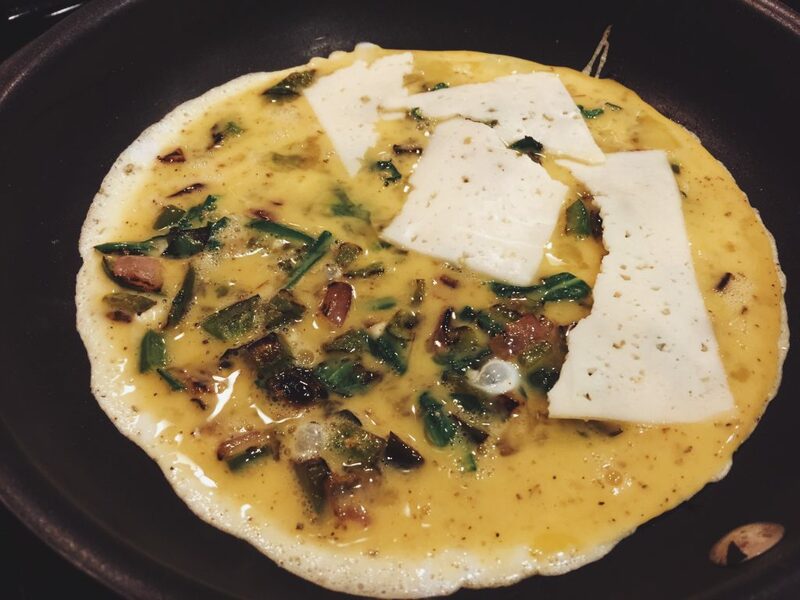 I added scrambled egg and havarti cheese. 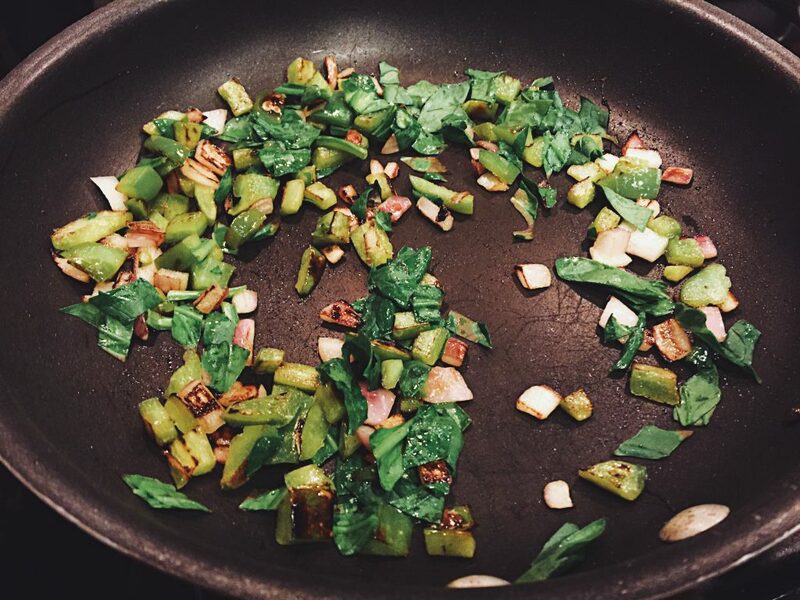 I am in desperate need of new non-stick pans. Mine are dead and my eggs are dead too, but I’m hanging in there until I get new ones! Kyle and I walked the dogs and then headed out to run errands on Saturday morning. We wanted to pick out paint for the bathroom and living room. Kyle’s mom had the cutest idea for her rocks outside. I had to steal her idea! I bought these cute little stones to add to my rocks in the front. I need to get more, but I love the character it adds! My mom and I were in baking mode! 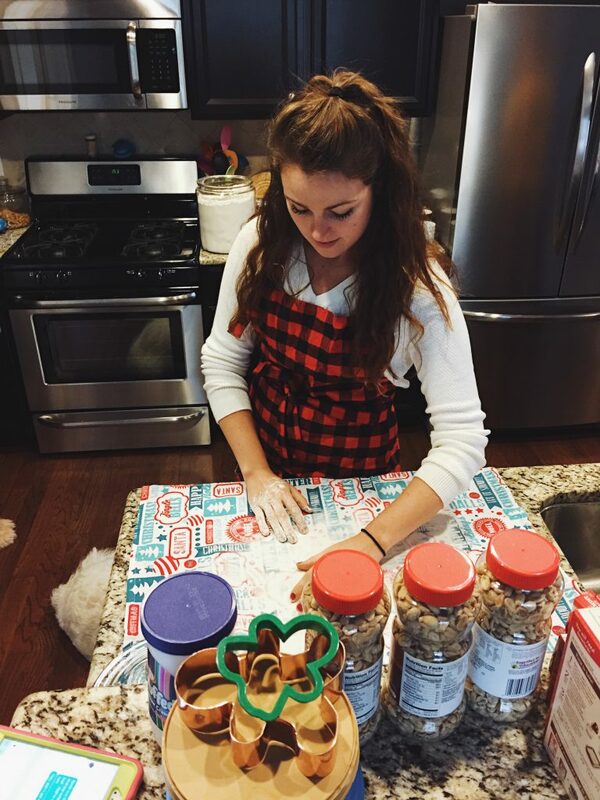 We were making peanut brittle, cookies, and more! 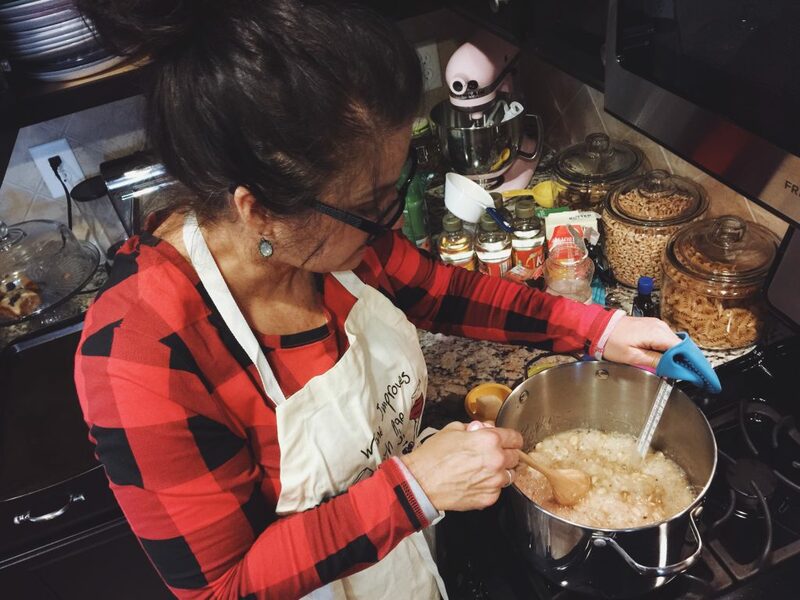 Peanut brittle is my mom’s Christmas specialty and the best peanut brittle I’ve ever had! We make tons of it and put it in tins for friends and family. 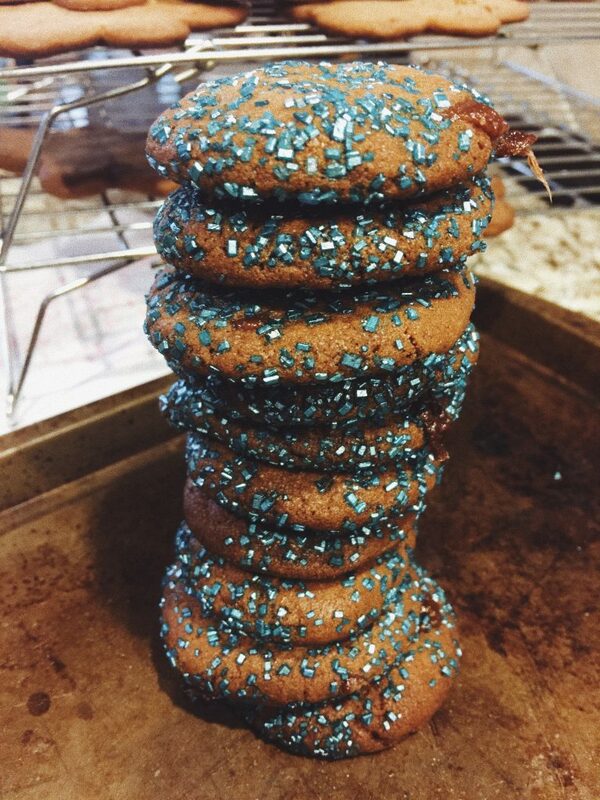 These ginger cookies were stuffed with caramel! My dad said they were incredible. 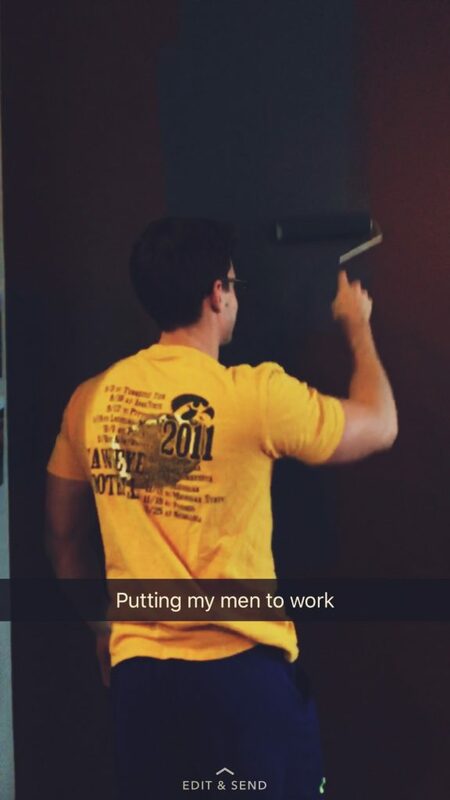 Kyle did a really awesome job painting that wall. We went with “approaching storm” blue. 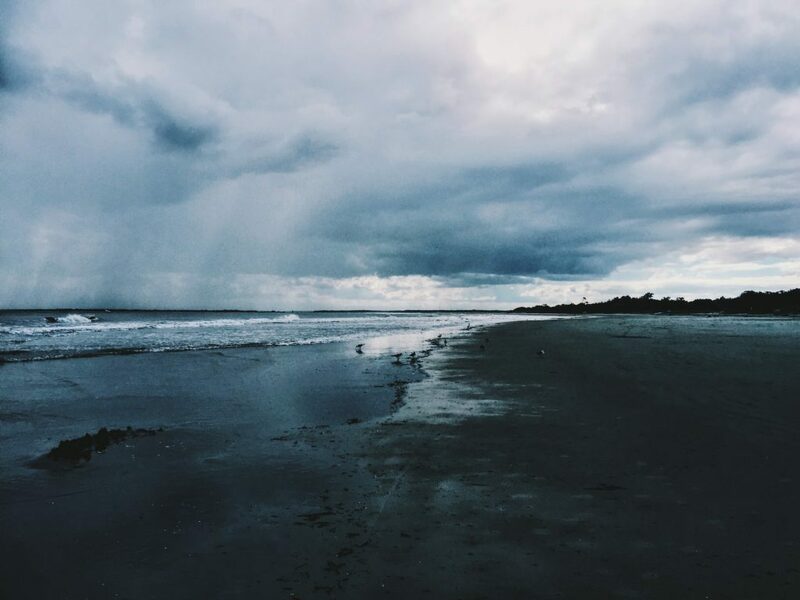 I took this photo on Sullivan’s Island and it’s my inspiration for color. After! I don’t know if I’m going to keep that gold mirror up there. I might do a photo collage…What do you think? We threw the pups in the back of the jeep and headed uptown to Kyle’s. I had a running date with Meighan and he had a date with the gym. 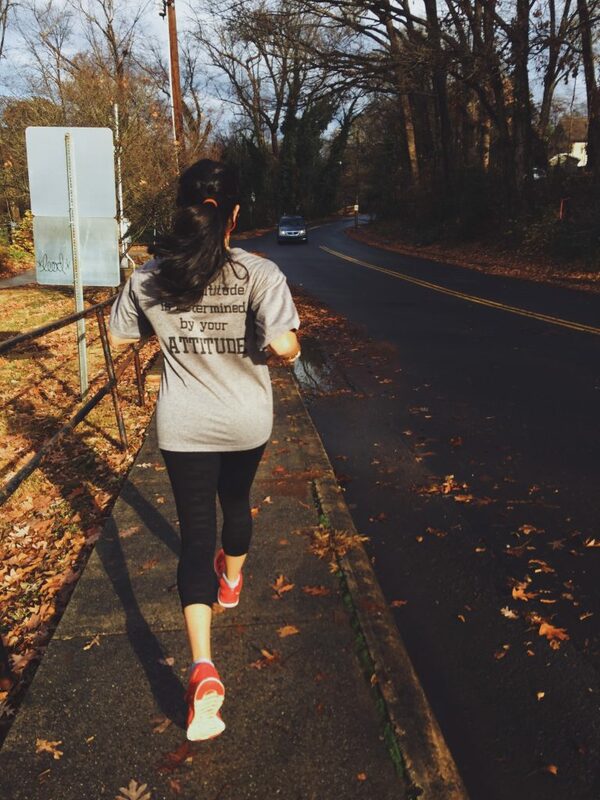 It felt so amazing and I ended up stripping off layers during the run because it got so hot. It was a bit rainy, but refreshing at the same time! We ran six miles at a light 9:45 min pace. We stopped for refreshments after our run. 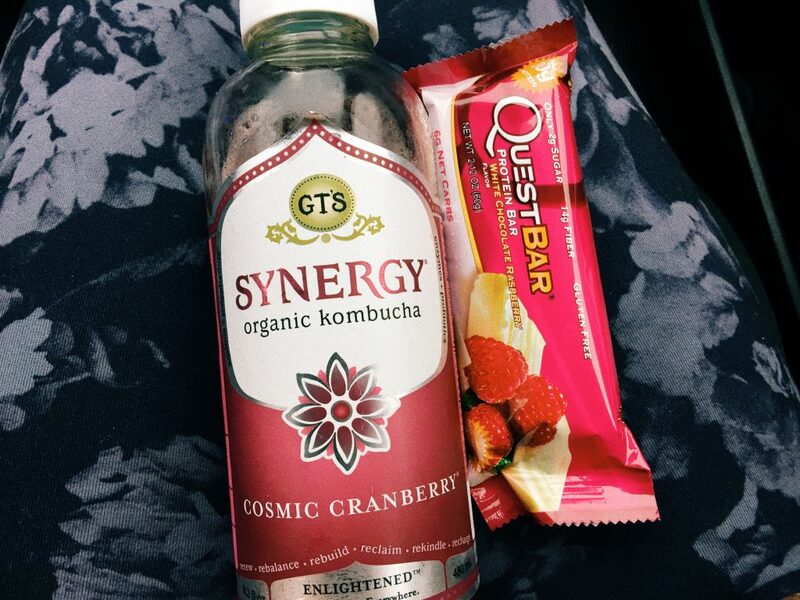 I had a quest bar and cranberry kombucha! We headed to the mall after our run. We did a little Christmas shopping and I found the most adorable skirt for Christmas mass. 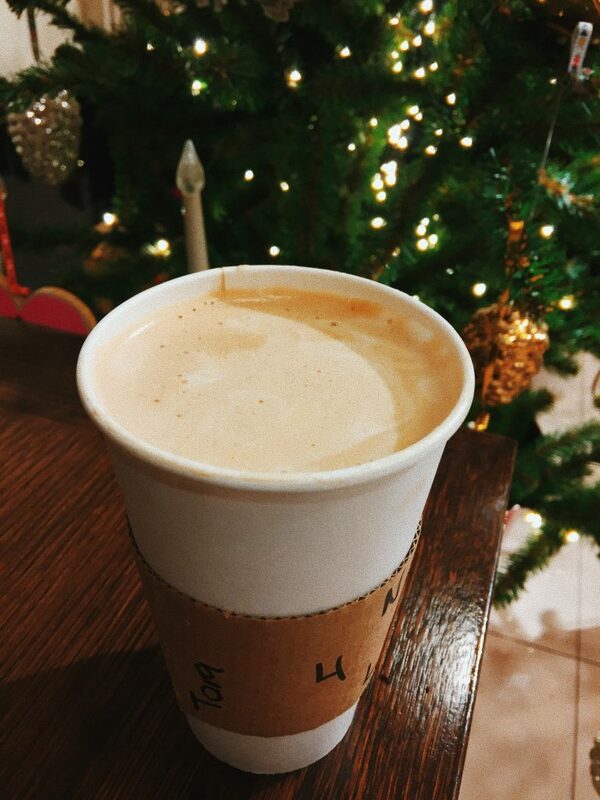 We stopped at Nordstrom for lattes before leaving the mall. I had four shots of espresso with skim milk. 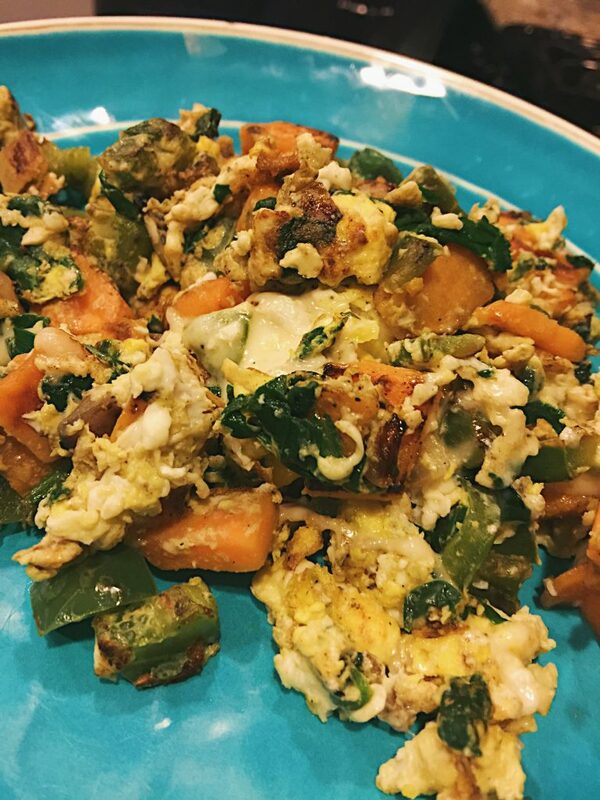 I had my yummy egg scramble for breakfast on Monday morning. 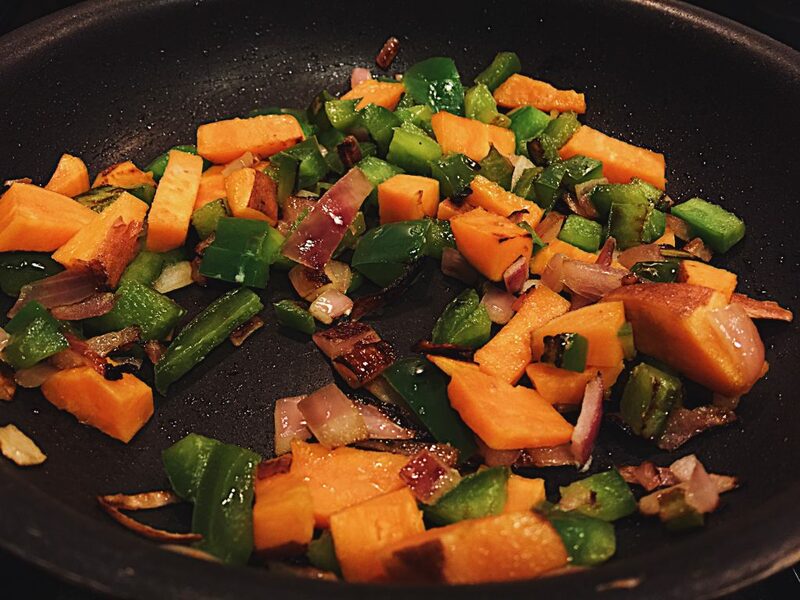 I added sweet potatoes this time! I microwave them first to cook faster. I went throw pillow shopping on Monday morning. I had NO LUCK. I went to Kirkland’s, Target, Home Goods, and Pier One! I usually love their pillows, but not this time. I’m going to try again tomorrow! I did like some of the pillows at Pier One, but I’m not the type of person that is going to spend more that $25 on a throw pillow. Theirs were like $60…no! 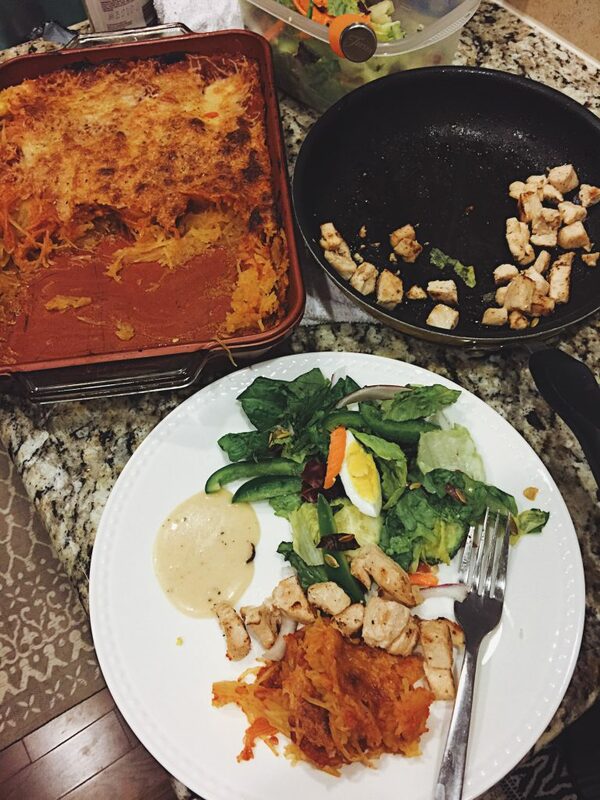 My parents stopped by for dinner on Monday night and I decided to make a quick spaghetti squash casserole with Italian chicken and salad. 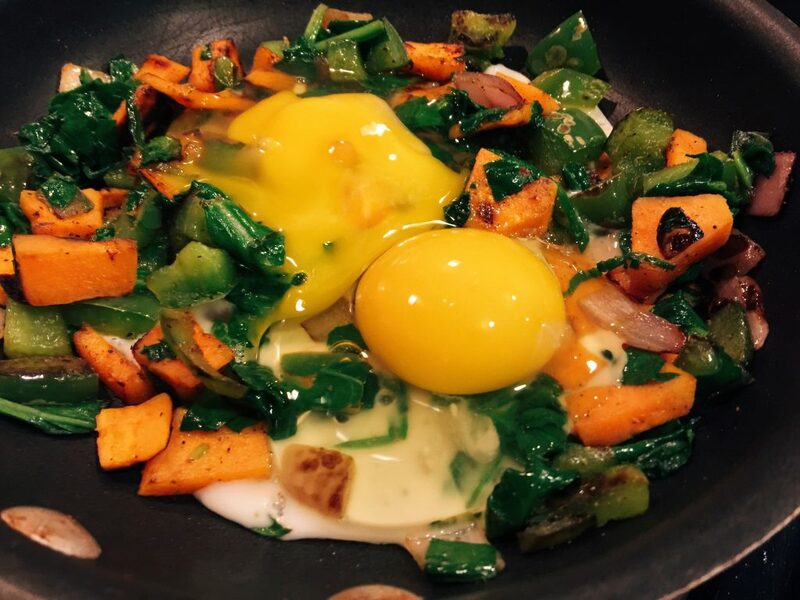 This is a quick and filling dinner! I prepared the spaghetti squash in the microwave and then added it to a casserole dish with homemade pasta sauce, mozzarella and Italian seasoning on top. I baked the dish at 400 degrees until the cheese was crisp and brown. 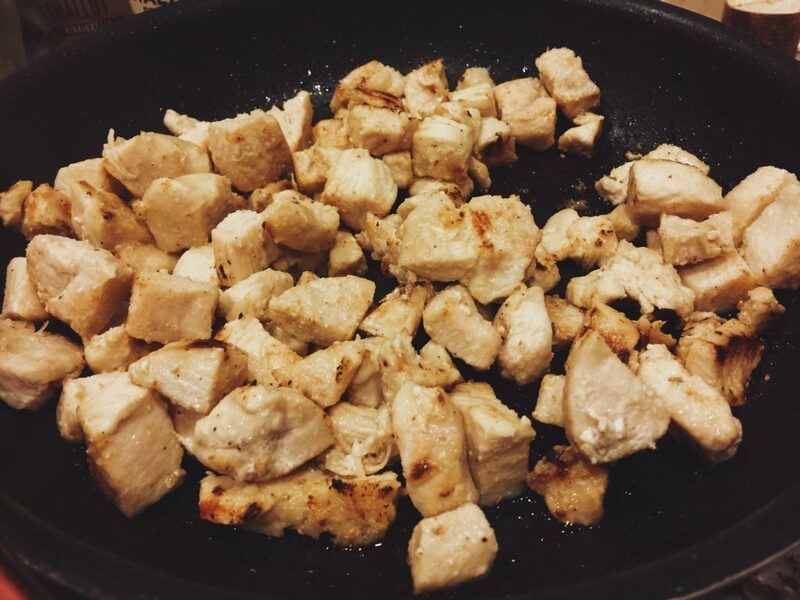 I cooked the chicken on the stove top with olive oil and Italian dressing. SO GOOD! My salad had Italian lettuce, soft boiled eggs, pepitas, bacon, carrots, onion, cucumber, and radishes. 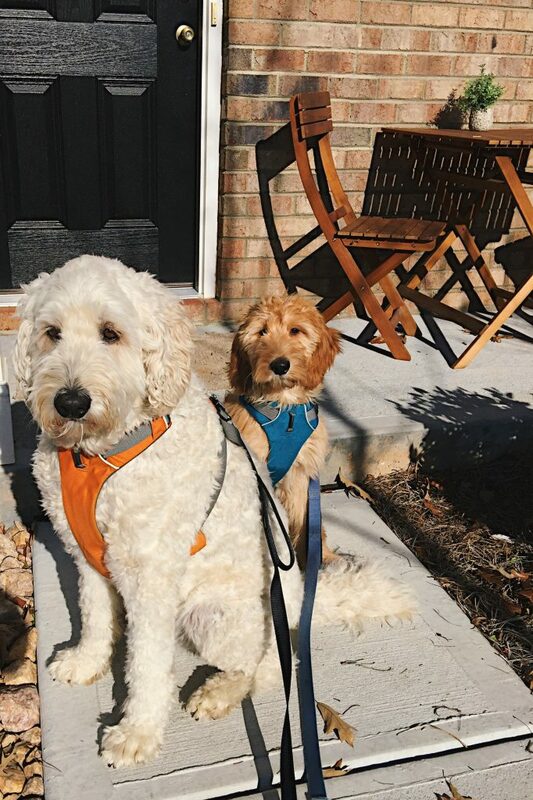 We watched the Panthers game together and then took the pups for a long walk. YOU GUESSED IT. Same breakfast on Tuesday morning! After breakfast, I headed to the post office to ship some gifts and then pick up food for Christmas Eve. I bought ten pounds of crab legs! We will have those with roasted potatoes and some fun little appetizers. 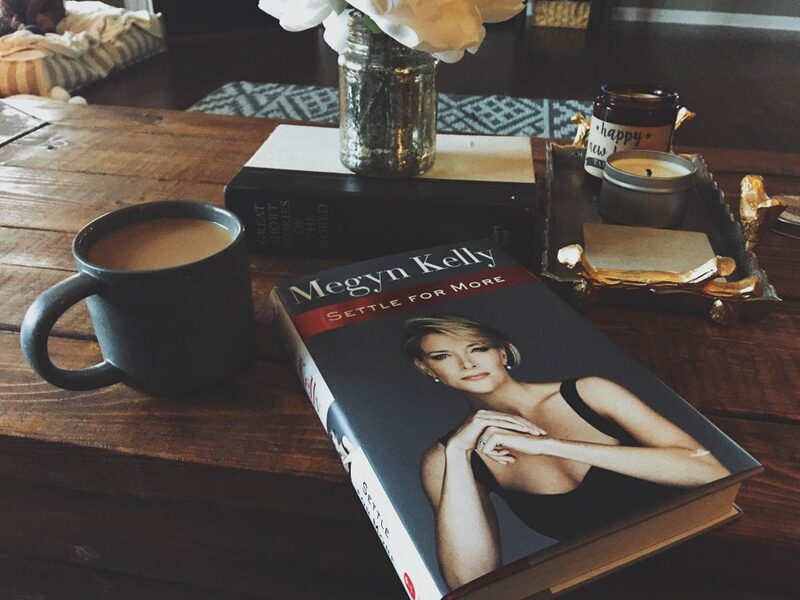 I spent Tuesday afternoon relaxing a bit with Megyn Kelly’s new book. It’s sooooo good and very inspiring for women. I will let you know what I think when I’m done. It’s called Settle For More. The boys relaxed with me. 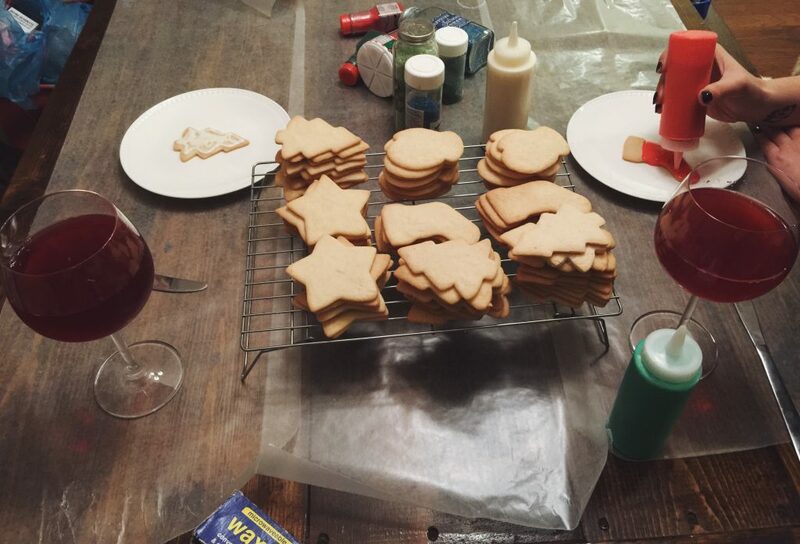 Becca came over on Tuesday night so we could decorate Christmas cookies. There is a pretty large homeless population uptown, but all of the faces are familiar. We see them in the same spots while walking around and we always exchange friendly smiles. These cookies will be bagged up and given to the homeless on Friday night. 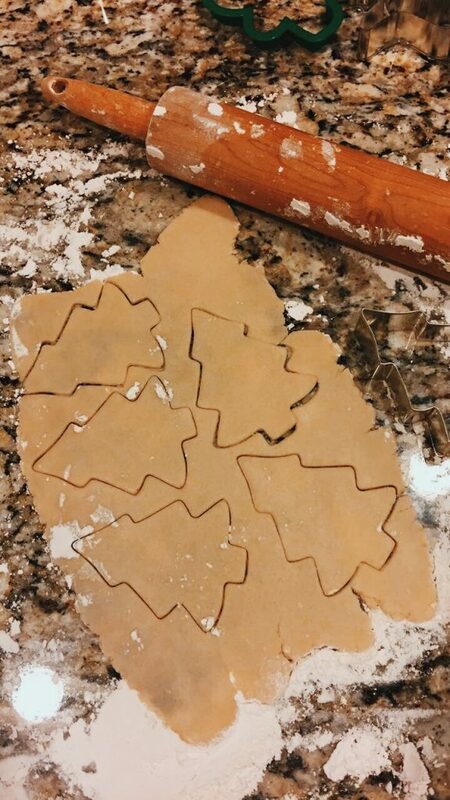 I make Christmas cookies every year and it’s another one of my favorite traditions. My royal icing has two egg whites, 7 tablespoons of meringue powder, 1 tbsp vanilla extract and 2 lbs of powdered sugar! I always use a squeeze bottle to apply the icing. 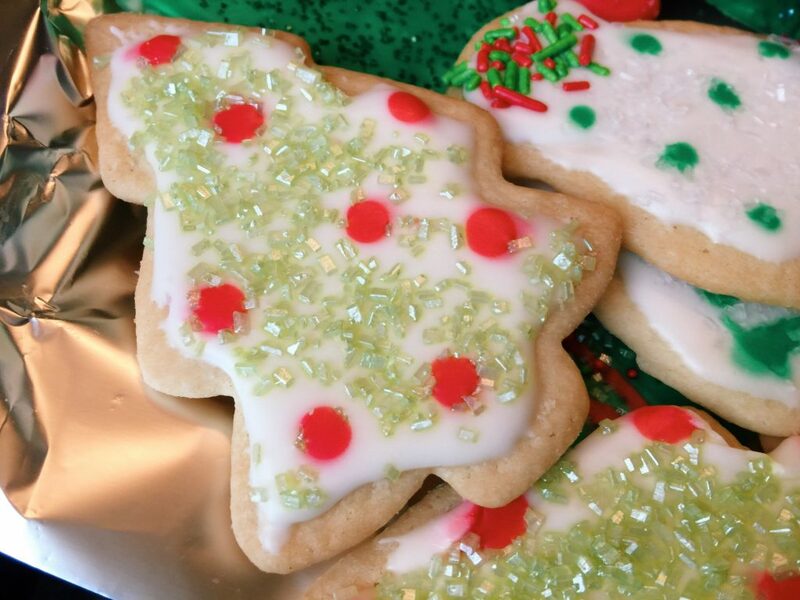 You never want to overdue the icing on cookies because royal icing bleeds. I hope you have a great rest of your week! I will be going into full on Christmas mode for the next couple of days! 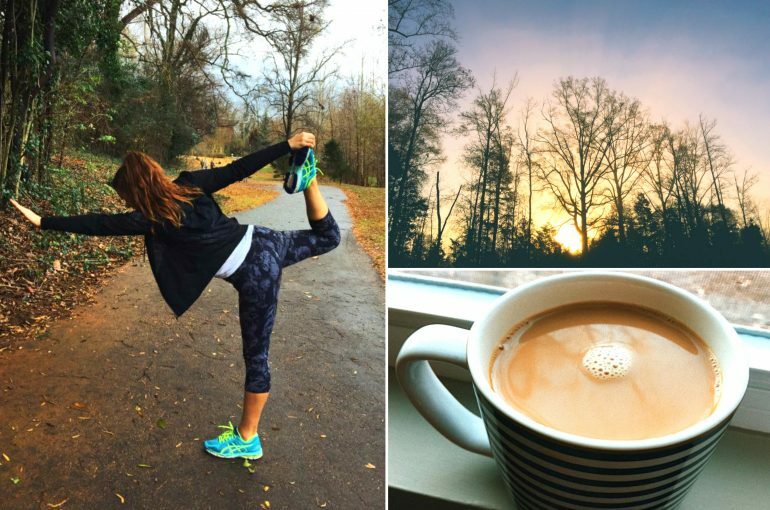 Don’t forget to follow me on Instagram and Snapchat>> @taralynnmcnitt for all of my updates!!! What is one gift you bought for someone for Christmas that you’re so excited to give to them? We love your couch! Where is it from? We are trying to find one just like it. I got it at Value City Furniture four years ago! 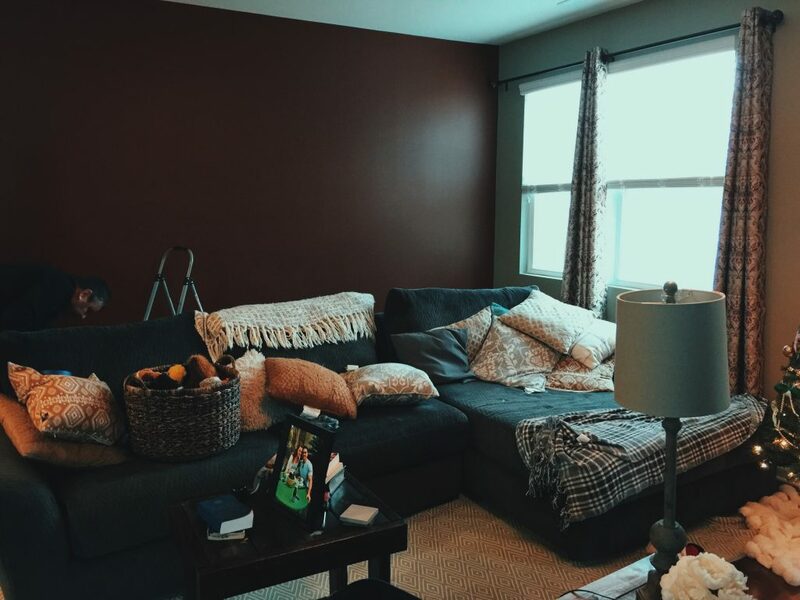 (charcoal/oasis/sectional) I don’t think they have the same one anymore, but they have similar! Living Spaces has GREAT couches. I just love reading “real life” posts leading up to Christmas. Such fun! 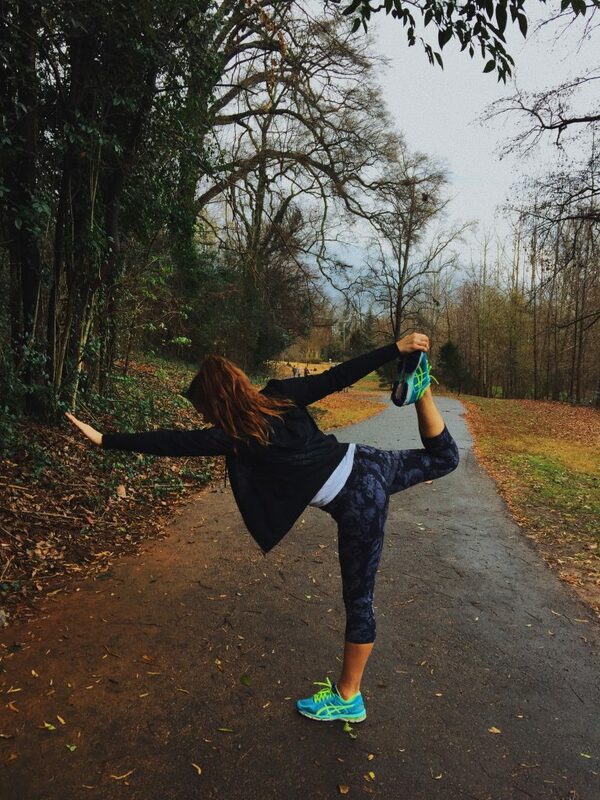 Kudos to you for staying healthy during the days before Christmas. My diet usually goes to heck a few days prior and it’s really hard for me to get back on track until the clock strikes the New Year, ha! Hope you got some pans for Christmas! I love the house updates. I think the mirror looks perfect where it is. 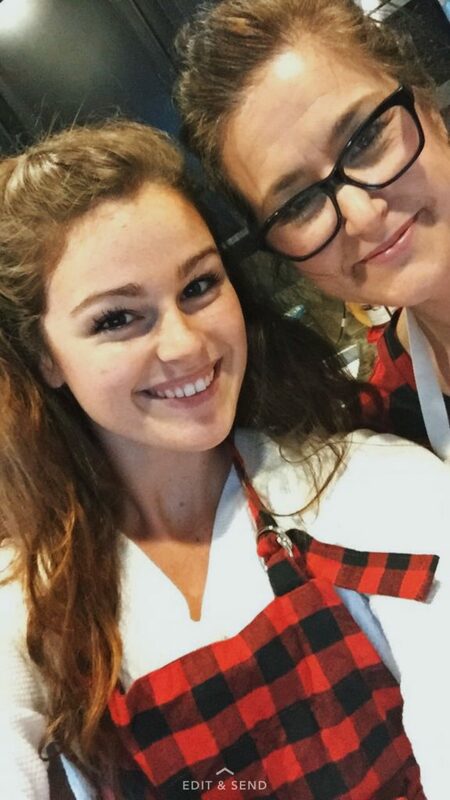 Good to hear your still hanging out with becca. I’ve missed your adventures together. I think you’re right! I want to paint the hallways a grey and do a picture collage! Happy holidays and Merry Christmas ??! 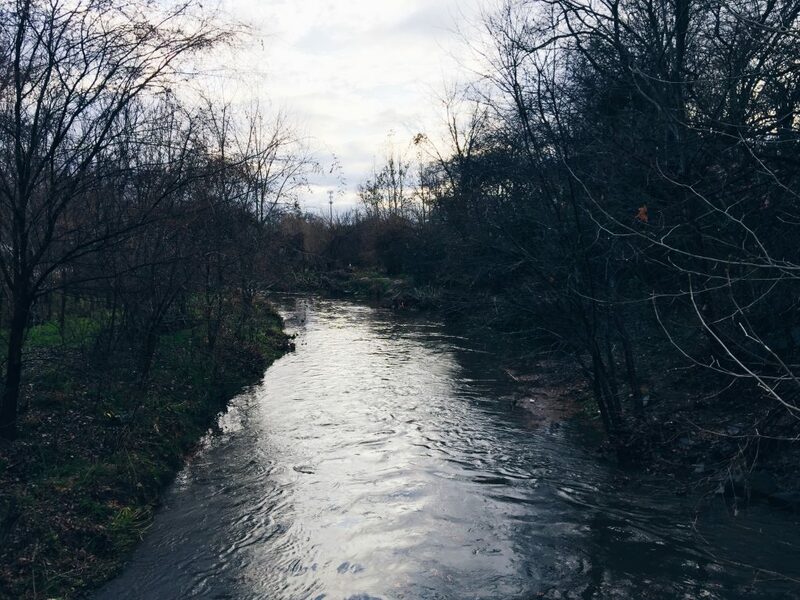 I spent Christmas in Georgia! I can’t believe how hot it was! Christmas Eve was spent with family playing games and drinking hot chocolate! I was so excited to give my daughter her own gymnastics ? ?‍♂️ equipment! She loves it! On another random note, which mascara do you use? Your lashes look so full and long! 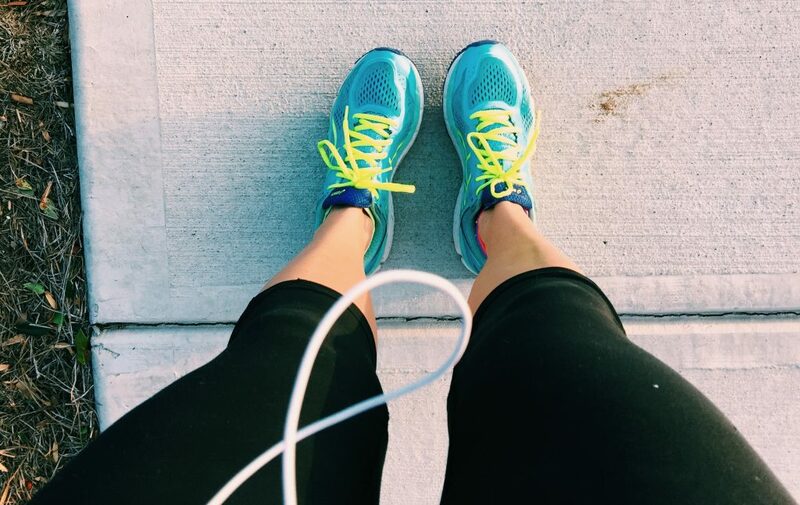 Are you planning on a fitness challenge anytime soon? I think it would be awesome for to have one for the new year! Sounds like you had a great Christmas! 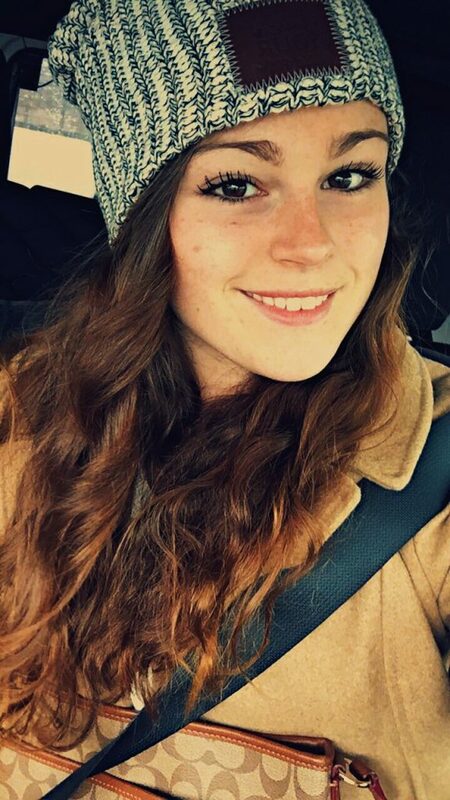 SO WARM in Georgia! 🙂 Your daughter got a great gift!!! How fun!! I haven’t seen you mention Becca in awhile. 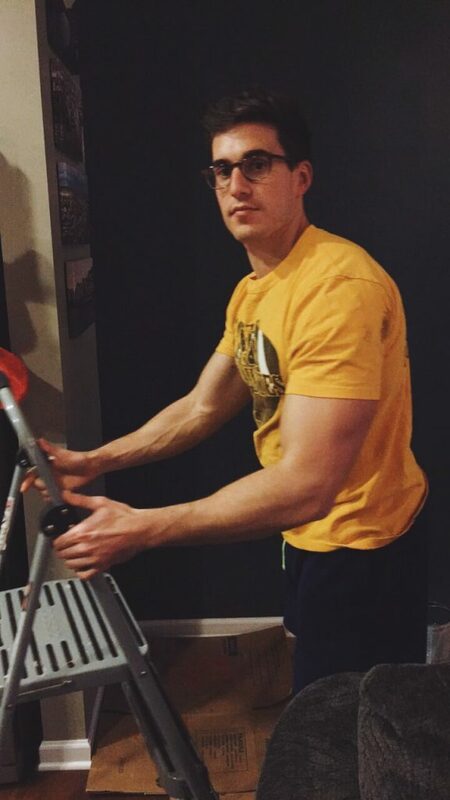 Do you two still workout together? And your house is so cute! Can’t wait to see more pictures. I hope you had a great Christmas! 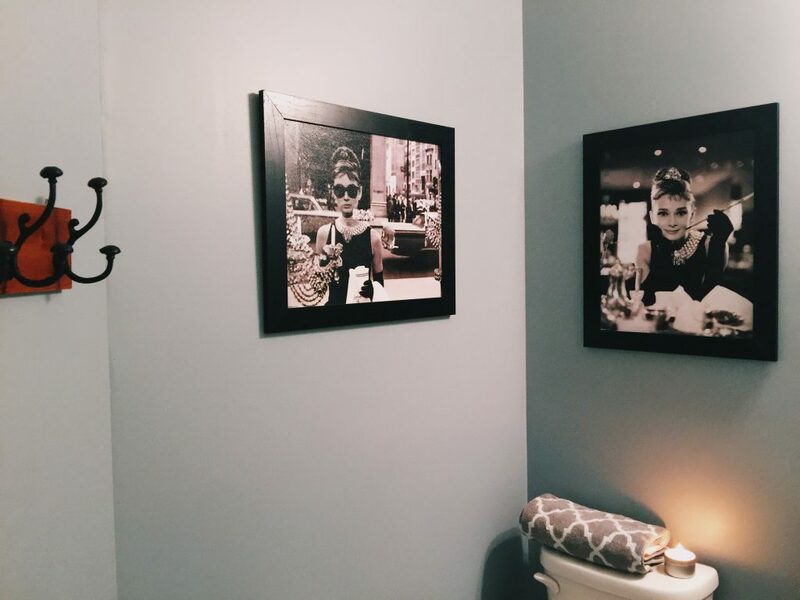 I love your Audrey bathroom! 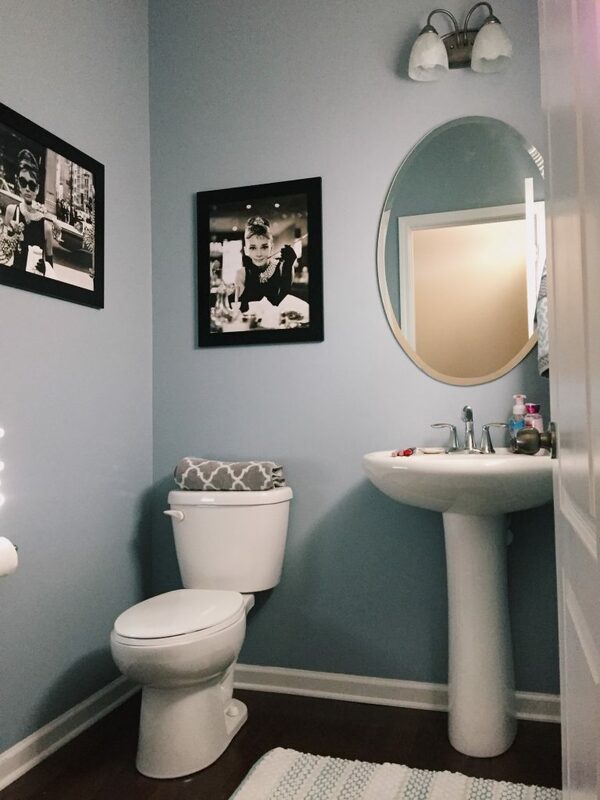 I recently redid my bathroom and it’s got Marilyn Monroe photos! I also LOVE the dark blue with the gold mirror. Gorgeous!! Congrats on your house, it’s beautiful! 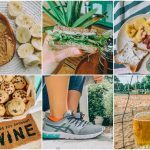 I’ve been following your blog for a long time and you are such an inspiration! I’m trying to lose weight and I wonder if you have ever tried Weight watchers or if you just counted calories? I’m looking for recommendations and I think you are the best person to ask since you have been so successful! I have never done weight watchers, but I do love that program because it’s all about moderation and I think that’s important. I like to do intuitive eating. I make sure to workout everyday, even if it’s a light walk, and then relax, live life, and try not to worry about calories or my weight! That helps as well. Your new house looks great, I love the paint colors you have chosen so far. 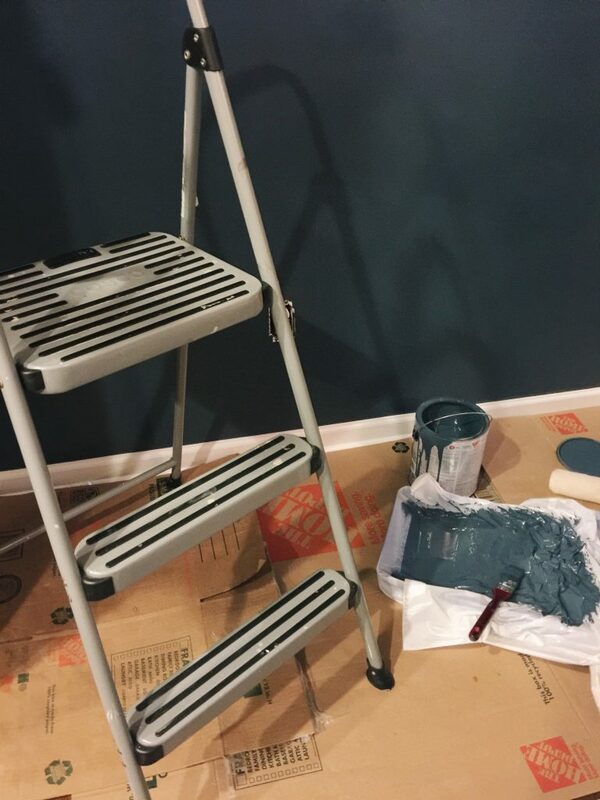 Can you please tell me what color you painted your bathroom? 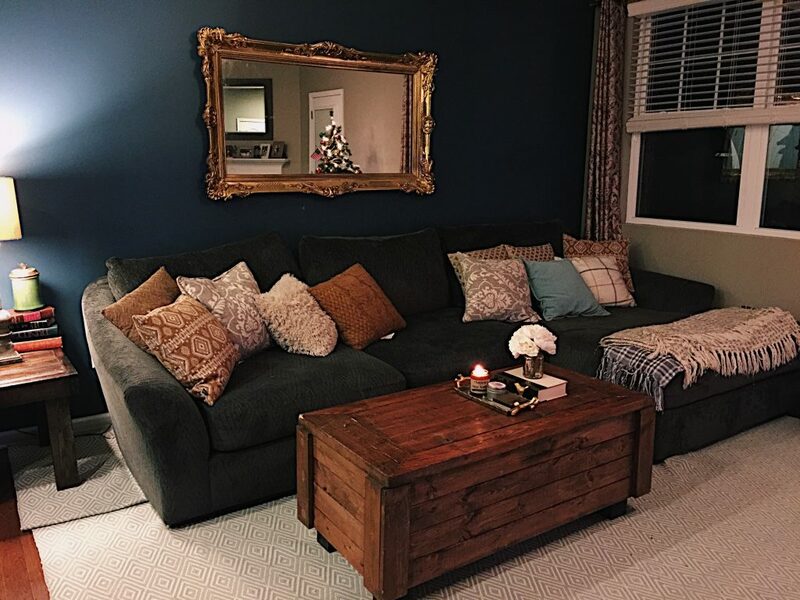 I really like that mirror over the couch! It fits well with the beautiful decor but also gives some contrast with the gold. I’m also obsessed with those pale green sprinkles :). 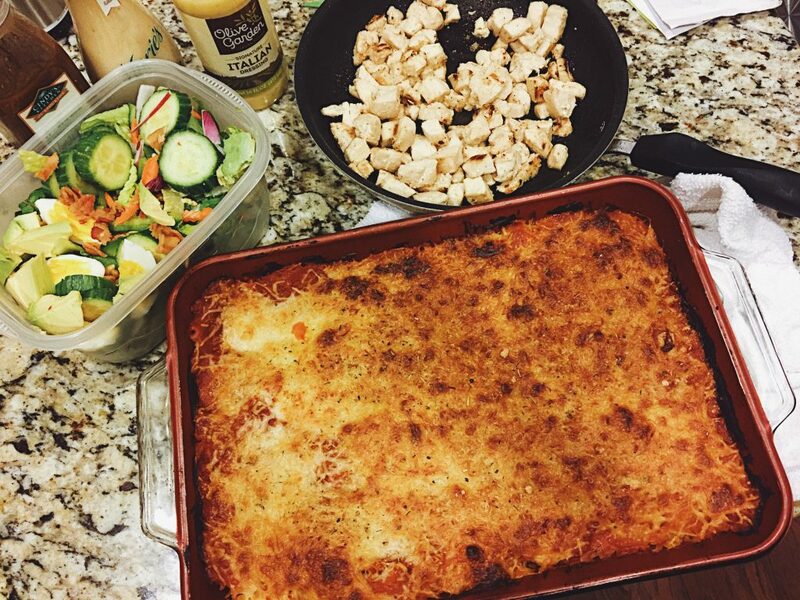 I love spaghetti squash but I’ve never tried to make a casserole with it. 2. I normally go to a party at a friend’s house where we decorate cookies and read Christmas story books but I’m working today. I’m with my Mum and Stepdad in Hampshire (UK) this Christmas. I do alternate Christmases with my Mum and Stepmum. So every other year I’m in New Jersey, Long Beach Island (USA). So I don’t have a fixed tradition really. I love the before and after pictures, I totally wouldn’t have thought that the colours would be better but they so are. That’s why I’m not an interior designer, I can’t picture things like that. I just need to see them. I keep meaning to say I think Grumples is looking amazing. You can really see a difference in him and it’s like he’s happier. That could just be the hair trim, but he looks so much younger recently. Btw your comment about the smoothies “they don’t necessarily taste great, but they are so much better for you” is literally my life quote when it comes to healthy eating! Lol that is the truth sometimes with healthier food! 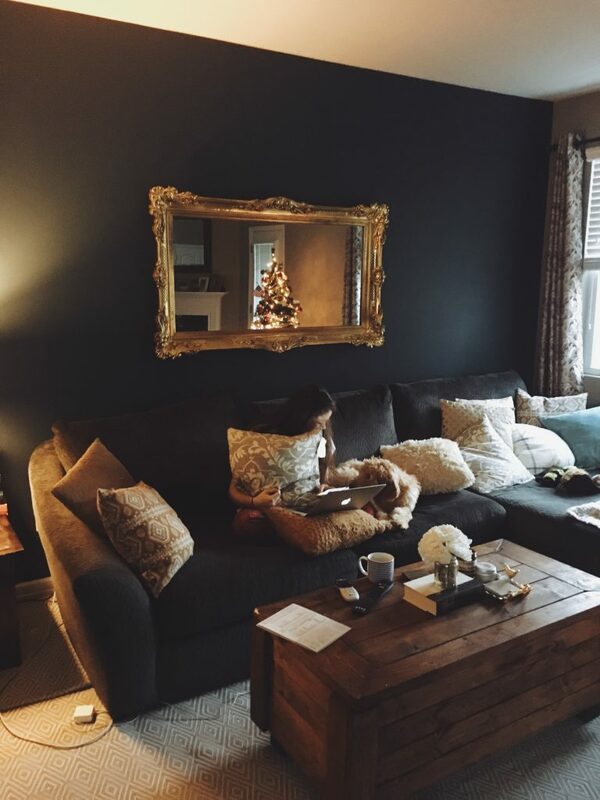 That gold mirror on the dark blue background gives off an amazing moody look to the room, and makes it look cosy. This Christmas I am spending it home for the first time in 3 years, my mum went all out and has decorated the whole house, inside and out. Plus it’s my nanas 85th birthday on Christmas Day so we try to make it extra special just for her. We spend Christmas Eve just as a family preparing for Christmas Day then at night we go to town and look at all the Christmas lights. I am super excited to give my dad his Christmas present, he has tried to figure out all week what it is, he literally has know idea. He is currently restoring a vintage car which has been in my family for 26 years, so this present is to help him with the restoration. Thanks so much 🙂 I love it for now! You are going to have a wonderful Christmas and I’m so happy for you that you get to spend it at home! The holidays will be spent in my hometown about 30 minutes from me at my parents. Christmas eve is usually spent at Grandma’s, and she actually moved into a townhouse down the street from my parents so I have to travel even less than the usual 5 minutes 😉 I’ll probably walk! My friend actually has a daughter turning 7 in January, so I’m getting her a play-doh set for Christmas (Frozen theme of course). I love watching kids open presents because they’re so truly excited! So glad you loved this post! I really loved writing it. I always love writing 🙂 I can’t stop snapping the boys lol They are just too cute all the time! I’m sure you’ll have a great christmas with the family and it’s great you don’t have to do a ton of traveling. Wow! Your home makeover looks great. I’m in love with it. 🙂 Also I like your meals. It’s so simple but it really does look mouthwatering and delicious. I will spend Christmas with my boyfriend in Prague. 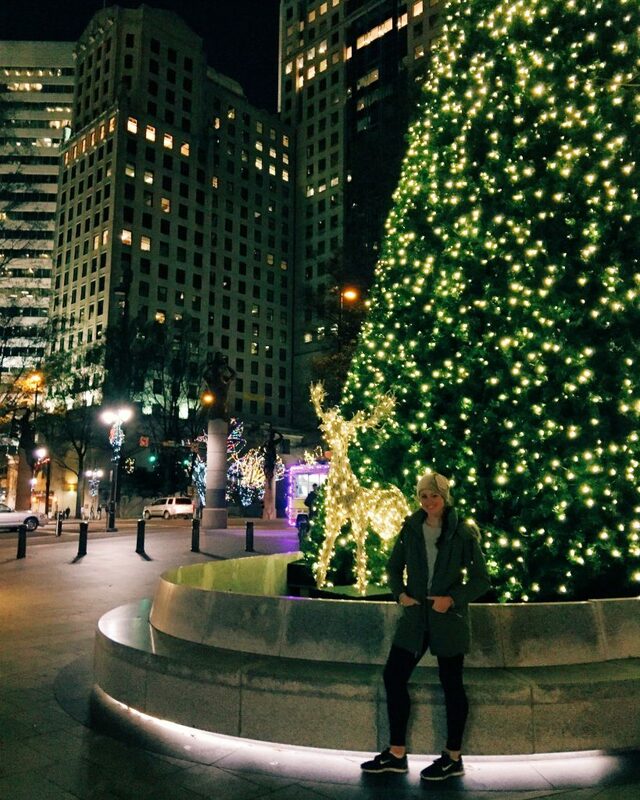 Def my fav and one of the most romantic places to Christmas time. I wish you and your family and friends a great merry Christmas! You are going to have such a gorgeous and warm feeling Christmas! I bet Prague so BEAUTIFUL!!!!!! Also, I’m super liberal but love, love, love Megyn Kelly and have a super big girl-crush on her. Can’t wait to read her book, too! Lol Liberal or Conservative, Megyn Kelly is such an inspiration for really working hard and having a really powerful voice! Love her to pieces. I think you’ll love it! Her childhood and college years are so relatable for many I’m sure! What color of paint did you use for the bathroom? 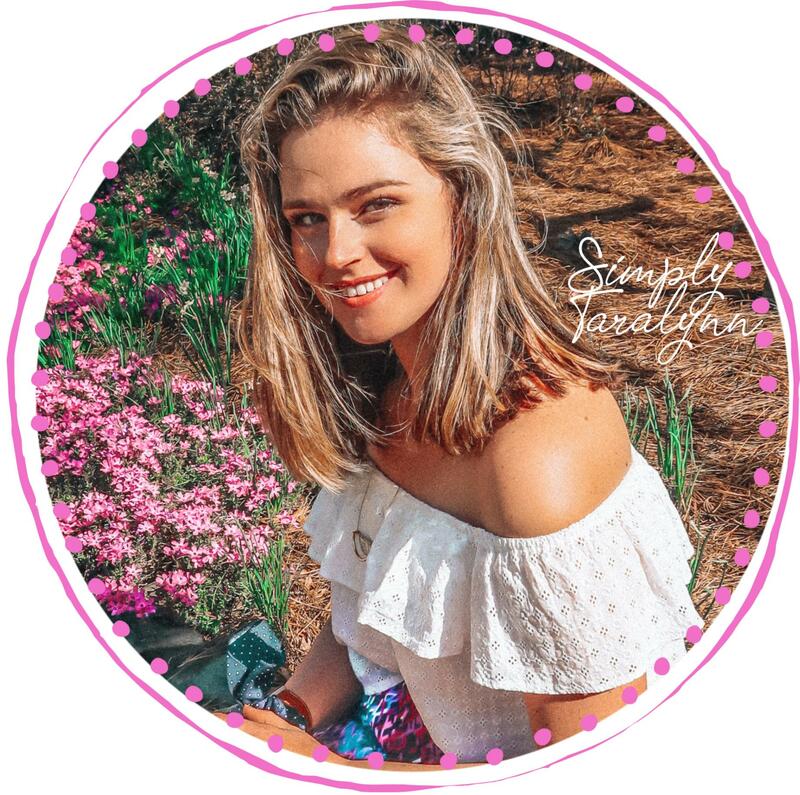 Hey Tara, do you use a bulk photo editor to place the same filters on all your photos? If so, do you mind sharing what application you use? 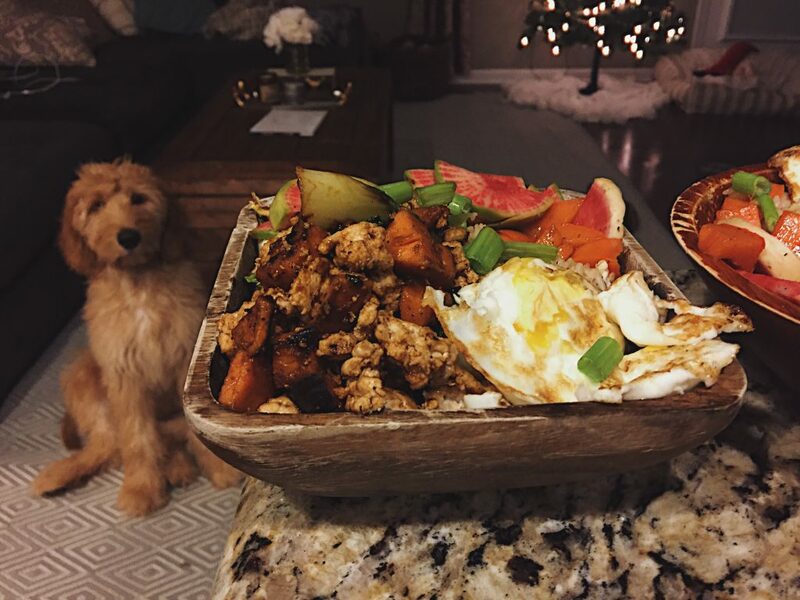 All of your food looks so tasty and healthy. You have inspired my entire sorority house to eat better. Your home is beautiful and I love the updates! 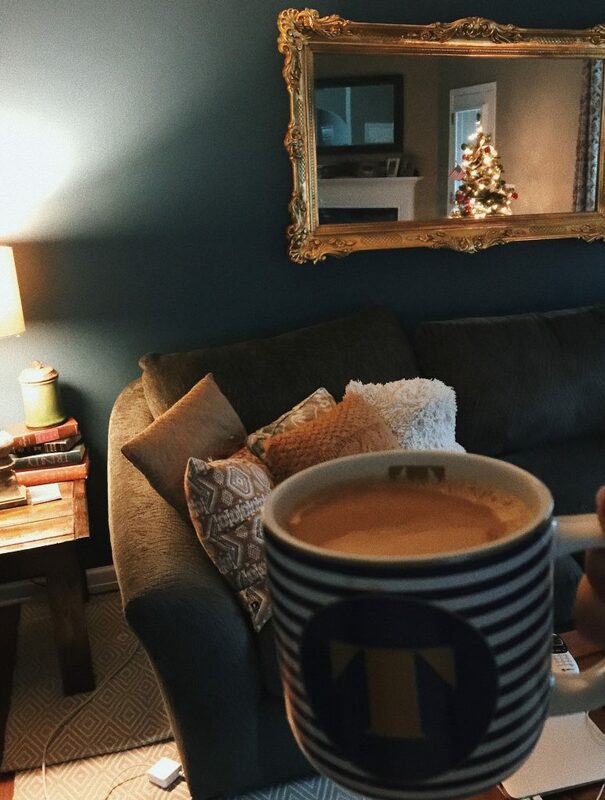 I love to decorate (maybe that’s why one of my favorite shows is Fixer Upper!) and I can’t wait to own a home so I can start fun projects! I like the look of the gold mirror but I always love a beautiful photo collage wall too! Your house is really looking good! Hope that you have a wonderful Christmas! 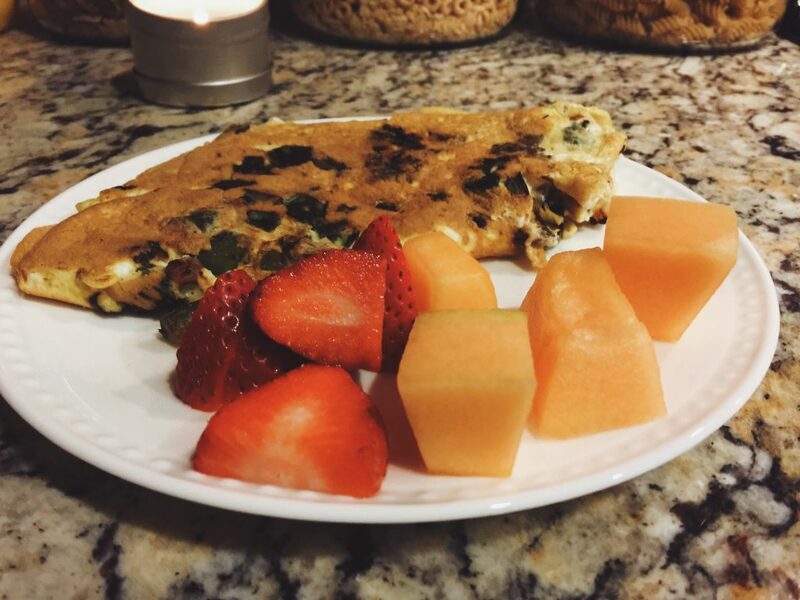 So nice to have a delicious breakfast! Thanks so much and it’s so fun to play around with it! Does Leo stay overnight with you most of the week? Do you get worried that Grumples and Leo will become too bonded with each other (or even with you!) 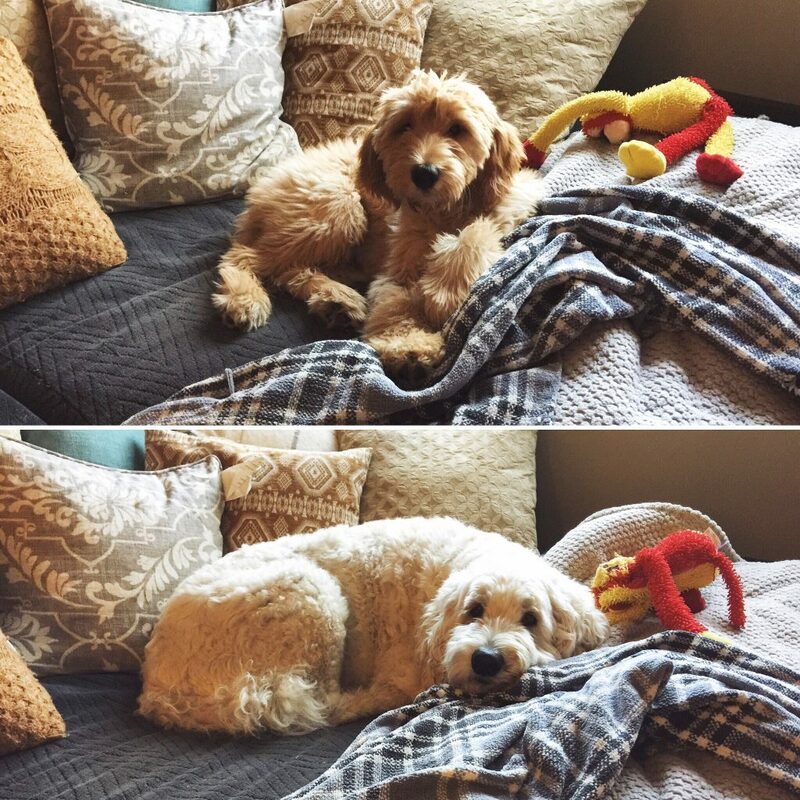 when Leo is old enough to not have to be constantly puppy watched anymore and stays at Kyle’s on the regular? I ask because I’m going through a similar situation with BF and wanted to know how you balance it. 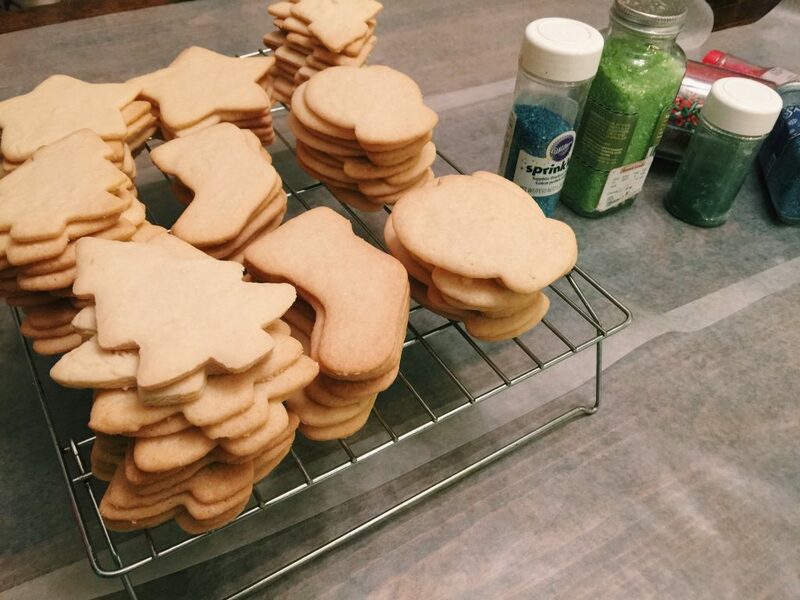 Also your Christmas cookies inspired me to try my hand at royal icing decorating tomorrow! He has stayed with me from the day we picked him up. 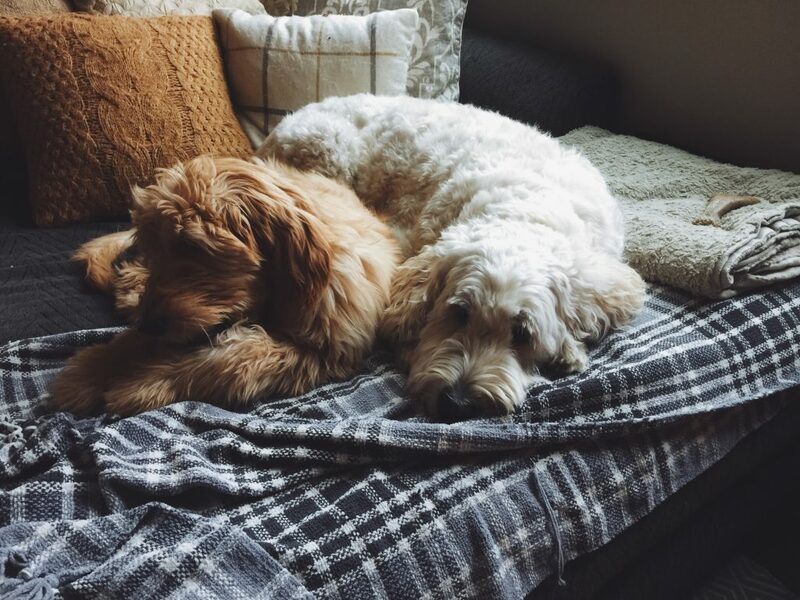 Kyle works Mon-Fri and Leo is too young to be alone all day. It’s easier for me to just keep him since Kyle lives all the way uptown and it would take him a while to pick him up every night. I usually only see Kyle on the weekends and Wednesday night. I’m not sure the schedule will change once Leo is old enough to stay at Kyles. I like him around during the day with Grumples and if I can watch him, I’d rather he be with me instead of alone 9-5. Grumples is a pretty independent dog, even though he loves Leo, he is really chill when it’s just him. Maybe take your boyfriends dog a couple nights once he’s old enough? Ease him into it? & Thank you!!! They’re so fun and easy to do. Is Leo your dog now?? How come you always have him at your place? Leo is too young to be home alone from 9-5 mon-fri, so he stays with Grumples and I. All of your food looks delicious!! I will defiantly be making some taralynn inspired meals as soon as I am back home from traveling. We are spending Christmas at my in laws house in California with all of their traditions and New Years back in Boston with friends! I’m excited to give my in laws their present! They have one of the old box tv’s and will never replace it themselves, so the ‘kids’ got together to get them a new one that weighs less than 300 lbs ha! Can’t wait to set it up with a giant red bow for them before they wake up… almost like Santa! Christmas in Cali? Jealous! I’ll be spending New Years in D.C.! HAVE A GREAT DAY TARALYNN!!! You never know what could happen in the future! I think we are very comfortable with where our relationship is at right now! Sometimes living separate makes a relationship super strong. I hope you have a great day and merry Christmas! Your question about the mirror from earlier in your post — I love that mirror! But I think you need something to brighten that wall up? Idk, just a suggestion. I’m so excited to see more of your new house though! 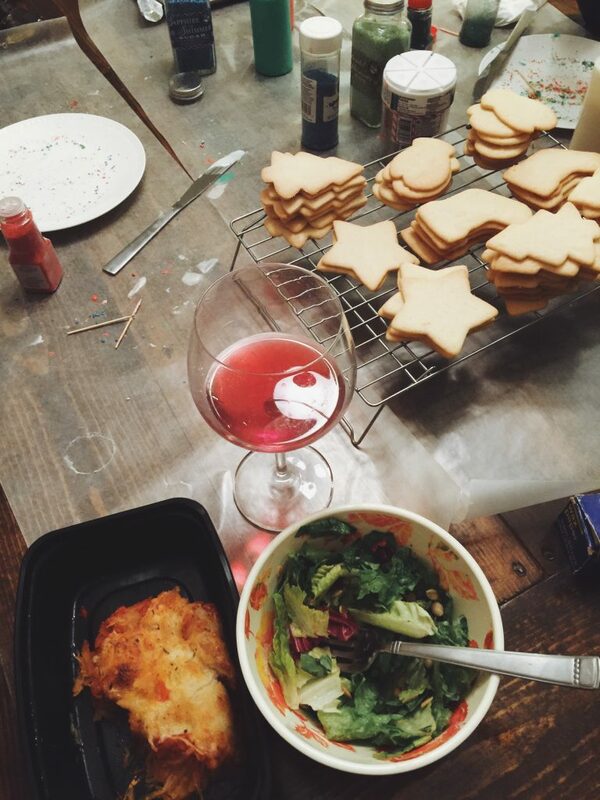 Christmas Eve, we make a nice dinner, go to church, and open gifts. The best present I bought this year was for my boyfriend – I was so excited about it that I gave it to him 3 weeks early! He has been obsessed with having a beard this year, so I got him a beard grooming kit. I ordered it from Etsy and it was so perfect! Thanks so much Brooke! I may play around with that wall for sure! Sounds like a fun holiday!!!! That is too funny! :) I know he’ll love it! You’re a great girlfriend! xo xo & Merry Christmas! 3) What is one gift you bought for someone for Christmas that you’re so excited to give to them? –> mmmh probably the gifts I bought for my boyfriend, though it’s not a big surprise since we always give lists to each other xD Maybe it ruins the surprises but at least we know we’re spending the money wisely! Sounds like a fun holiday! 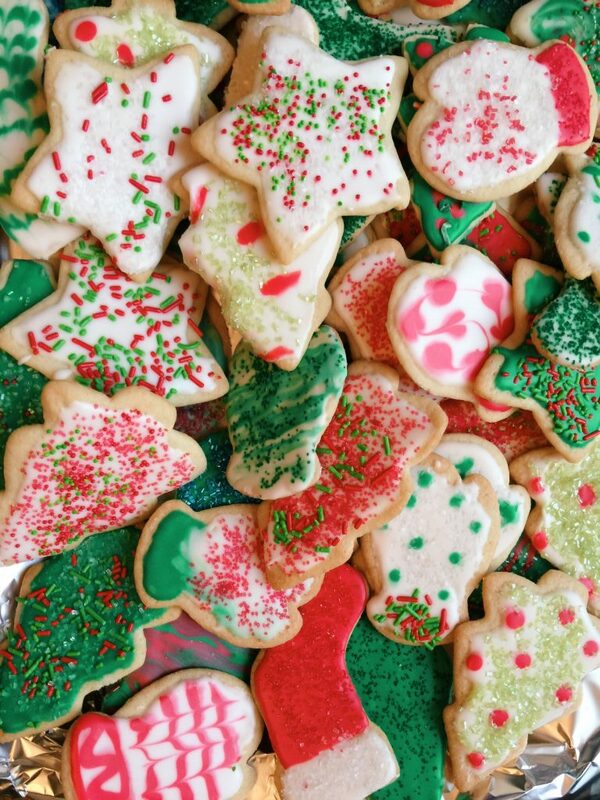 I bet you guys have the best holiday food! I know it’s super corny, but I really miss my boyfriend during the week too. It’s difficult sometimes to find time with the daily work grind! Makes weekends even better. I’ve lived with someone before as you have, and its somewhat easier but also hard because you have to actively work to make the time special! I think living separate is so smart for relationships because time spent together is so much more special. Congratulations on your new home! I noticed in the baking photos with your mom that you had one of the individual brownie pans. I have been looking everywhere for one. Do you mind sharing where you found yours? You bought seafood a week ahead of time? 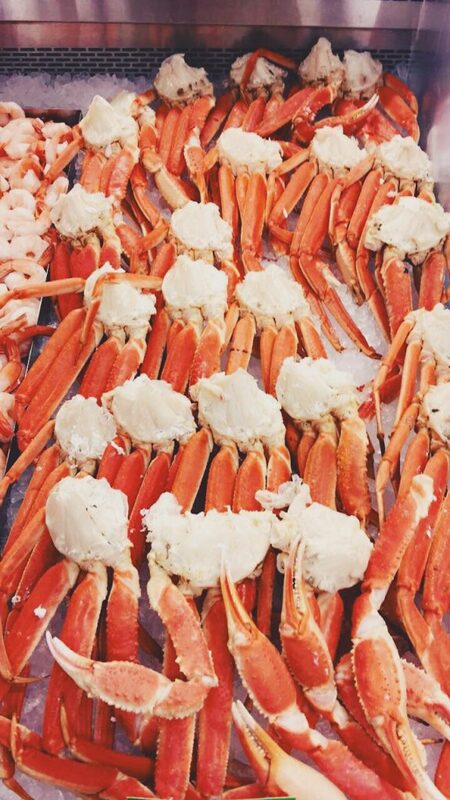 I bought frozen crab legs. They’re in the freezer. On Christmas, my husband and I will be going back to where our parents live. We do Christmas morning at my parents and my mom makes challah bread french toast and fresh squeezed mimosas. Then dinner at his parents where his mom makes a traditional Korean meal. On Christmas eve my dad and I go sit in the mall and watch everyone go crazy over last minute shopping then we go see a movie. I got my husband a periodic table of hip hop poster. He is a big rap/hip-hop head and this poster is incredible. I also tried to do all my shopping this year from small vendors or local vendors. Most success except for my older brother. He was really wanting a certain pair of slippers. OH YUM! All of that food sounds incredible! I’ll be one of those crazy last minute shoppers today! :) My friends and I are going out to hustle! You did well on the shopping this year!! Just wanna say congrats on the new house!!! 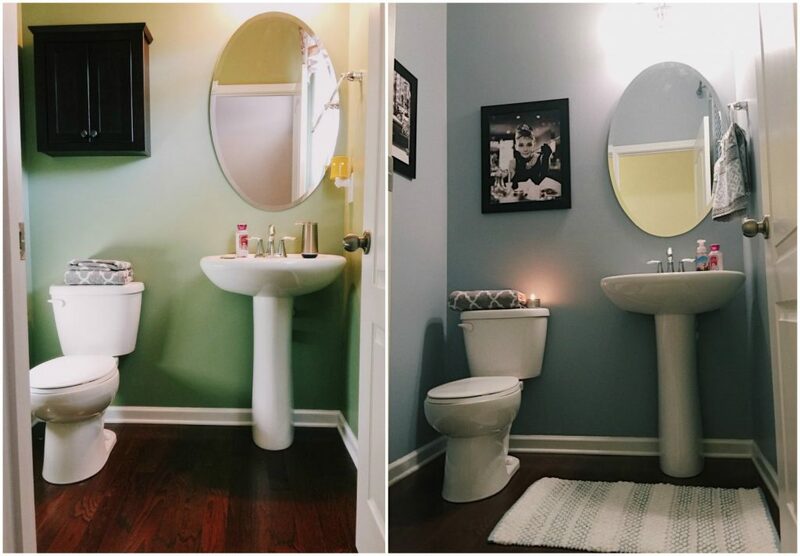 Love the colors you picked for the bathroom and living room. You do such a great job decorating! Have a great Christmas in your new home!!! 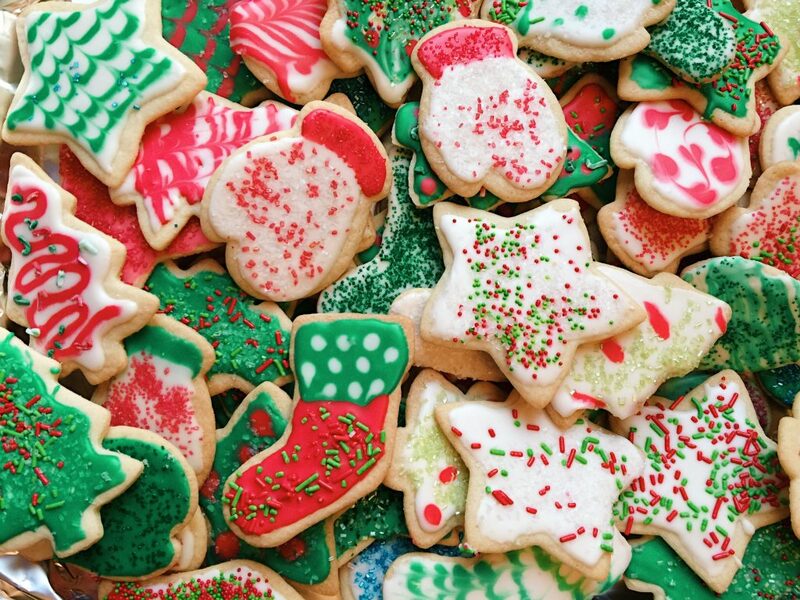 Those cookies look so good!!! How sweet of you to hand them out to the homeless! 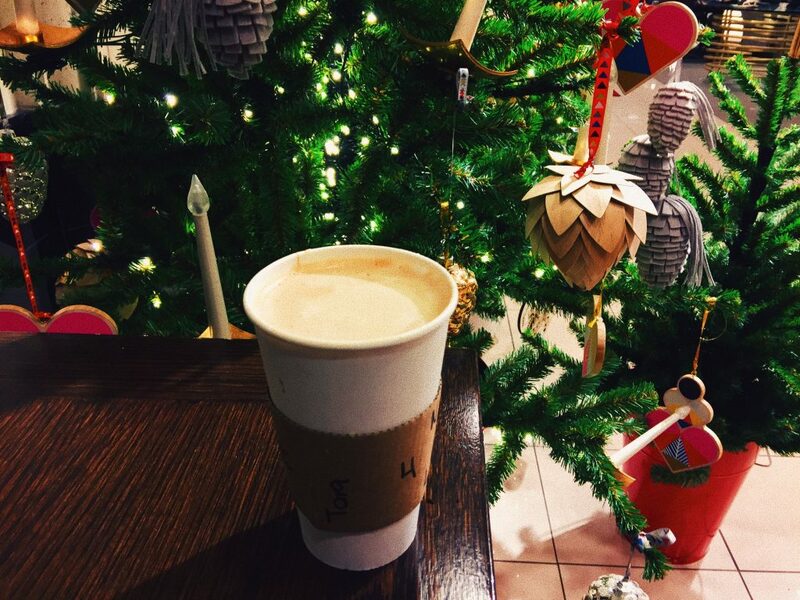 1.Where will you be spending the Holidays? This year I will be spending Christmas eve at my dads moms and then my gfs grandparents and then her parents after that and then Christmas day my parents and then to my great aunts house we haven’t spent Christmas with them in a long time because normally my moms mom does Christmas but I don’t guess she is this year we haven’t heard anything from her her mother and her brother passed away and family get togethers have I guess just been too hard on her so it seems like we don’t do them anymore with that side of the family. 3.What is one gift you bought for someone for Christmas that you’re so excited to give to them? I was actually thinking about doing a rustic framed mirror and photo collage around it! Sounds like you have a very nice Christmas ahead of you! I hope you enjoy it. You did well on gifts this year!! I seriously love that you bought a house and it’s inspiring me to really focus on saving money so that I can make it happen for myself in the near future! 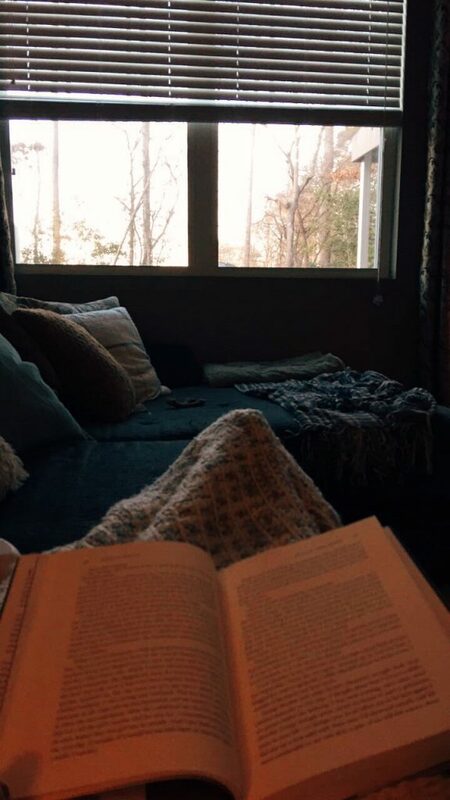 I can’t wait to have a place of my own. I am all over the place for the holidays. Christmas Eve I always go to my dad’s for his party. 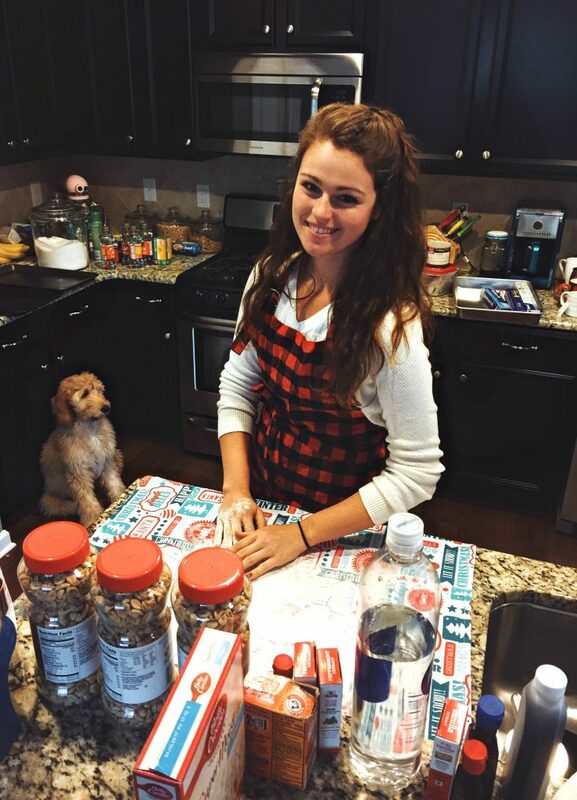 Christmas day I see my boyfriend’s parents and then I cook dinner for my mom and grandma. I can’t wait to give my dad and stepmom the FitBits I bought for them! They are committing to healthier lifestyle starting the new year. I’m hoping this will keep them motivated and accountable. It feels really nice to be able to call a place home! 🙂 Just create a budget and you’ll be there in no time!!! Sounds like you have a busy Christmas, but fun! 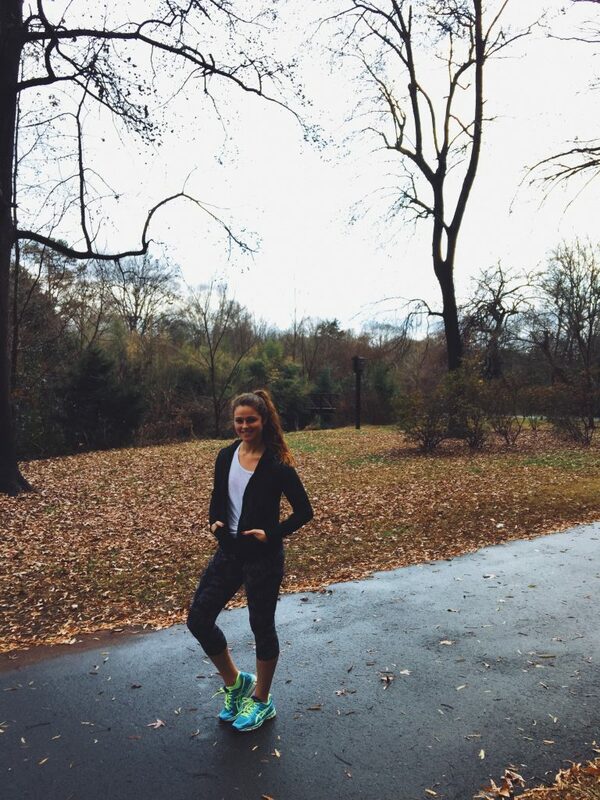 FitBits are a great gift!! Merry Christmas Taralynn! ?? I LOVE how you gave those cookies to the homeless! So sweet and what we should all be doing a little more of….have a wonderful time with family and friends this season in your new crib!! We will be spending our holidays at our family cottage in Muskoka, Ontario! It’s beautiful. If you haven’t been, I highly recommend. My father in law past away this past summer, and we found an old Christmas card to my mother in law, from him with the words “You make everyday Christmas, my love. -Eddie” So we got that sewn into a quilt, in his actual handwriting. We can’t wait to see her reaction! Wow! That sounds gorgeous. 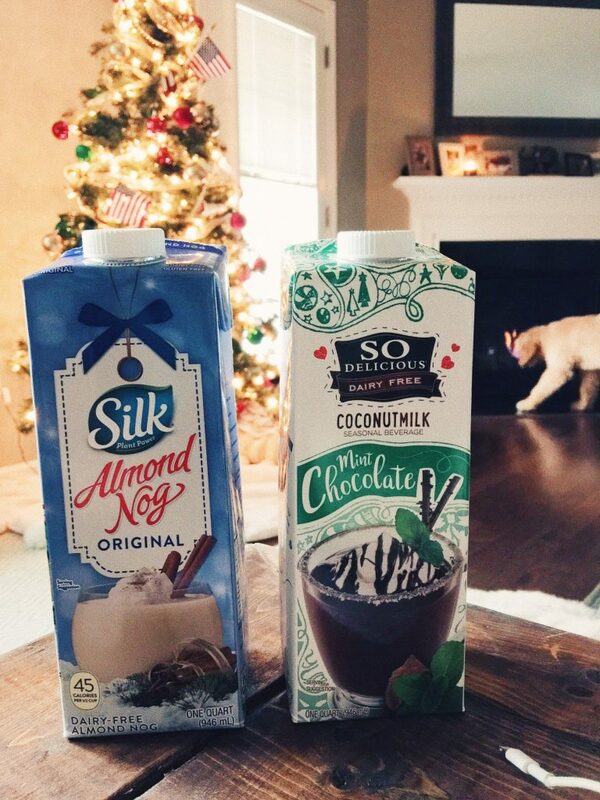 You’ll definitely be having a white Christmas. You are killing me with this Christmas talk. Chestnuts and marshmallows over the fire? Where is my invite? Your holiday seems so perfect. Leo is Kyle’s dog. He just stays with me because of his job. So glad you’re loving Charlotte!! I grew up in Waxhaw, and still live right outside of Charlotte! 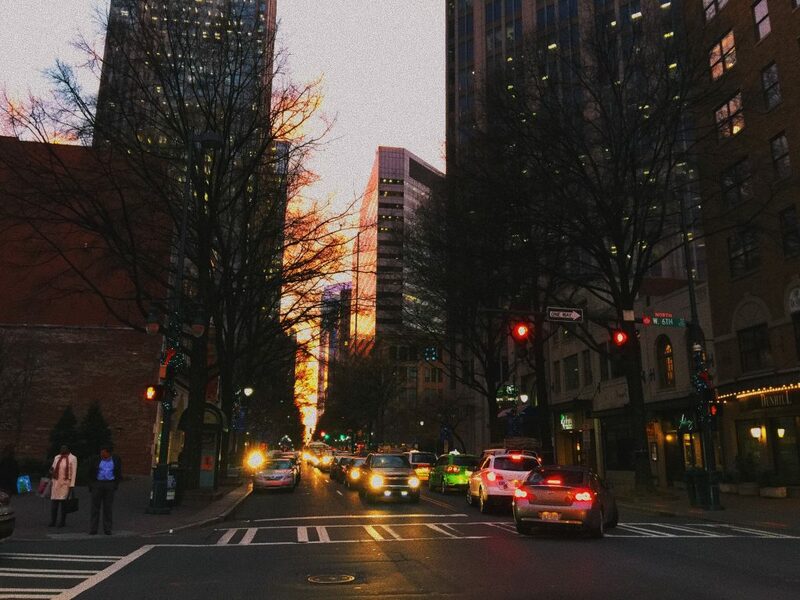 It’s an incredible city– the perfect mix of urban and suburban. There truly is something here for everybody. 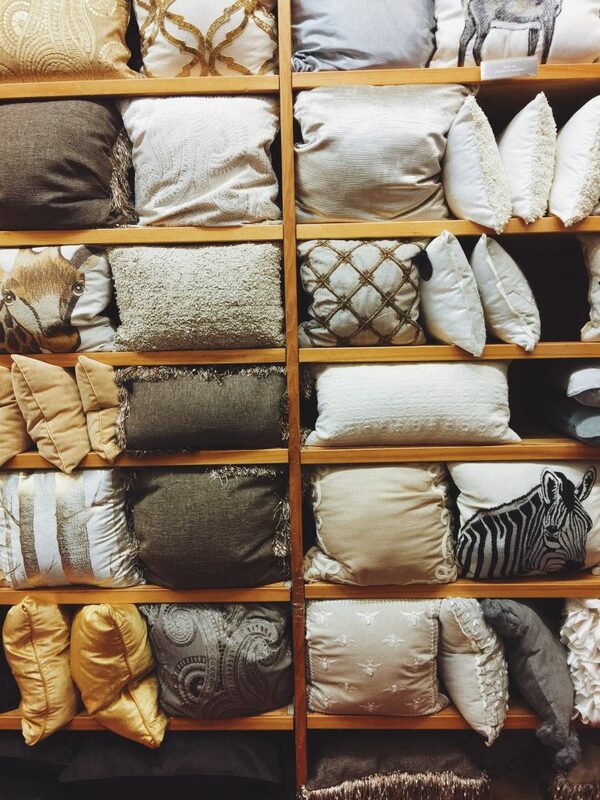 Tip if you’re still looking for throw pillows: I went to this huge store called At Home for ALL of my throw pillows! Depending on what side of Charlotte you’re on, there’s one in Pineville right next to Carolina Place Mall, and the other one is in Concord by Concord Mills Mall. They have a huge selection at what I thought were great prices!! I LOVE Waxhaw. I haven’t been there in a while and it’s way overdue. I share your love for Charlotte! I think it’s the perfect city. My friend was just telling me about “At Home!” & I must check it out! I heard the have really good rugs too and I also need one of those! I hope you have a wonderful holiday! By the way…Eggnog ice cream at the Waxhaw creamery! Question – is Leo yours or Kyle’s? When he first came into the picture it sounded like Kyle got him, but it looks like he is with you 99% of the time. Just wanted to know cause I was a bit confused! Yes, Leo is with me 99% of the time, but that is because he’s too young to be alone. Kyle works 9-5 and so Leo stays with me on work nights. It’s easier than him picking him up every night. 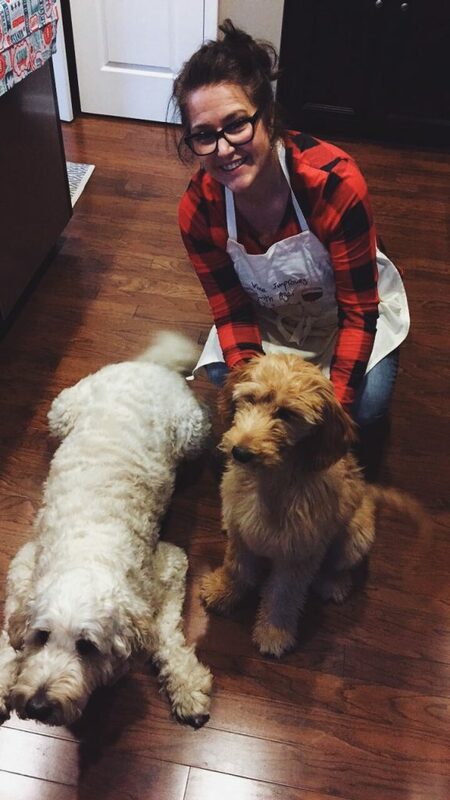 But Leo is Kyle’s dog. I love your decor and I really think the gold mirror looks great there! Congrats on your new home. I second the Rachel Ray pots. I’ve had mine for a few years now and LOVE them! Have a Merry Christmas! Spending the holidays with my family as usual this year! Christmas Eve we usually go to a service, but our church had their services this past weekend. We’ll just be heading to dinner with my immediate family, which we’ve done the past few years. And I’m super pumped to give my friend a personalized embroidery ring for her new home with her new husband; I know she’ll love it! Where did you get your couch? It seems to hold up well with the dogs and my one dog is destroying ours! Sounds like a fun and relaxing Christmas. Love that your church has service this past weekend! I bet your friend will LOVE that! My couch is from Value City Furniture! 1) I will be spending the holidays at home in freezing Chicago! 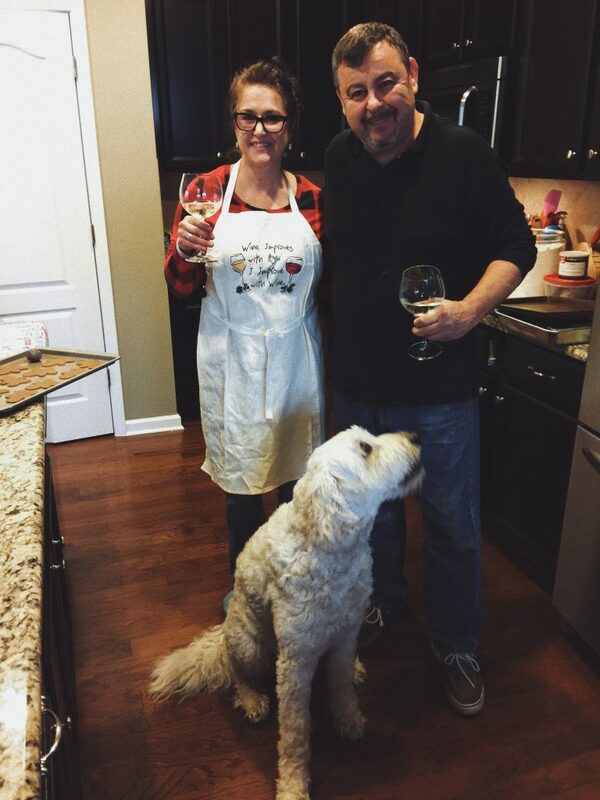 2) My parents are hosting extended family for Christmas at their house. It usually rotates between the aunts – I’m so excited to see all of my relatives and spend some time together. BURRRRRR But fun. Do you have some Garrets popcorn in the holiday gifts?!?! I hope you have so much fun with your family & I’m sure your brother in law will LOVE his gift!! The best gift I found is for a gift exchange on my mom’s side. The theme is “warm and cozy” presents and I got a huge thermos for hot water/drinks that says ‘Baby it’s Cold Outside’…perfect for our cold Wisconsin winters! 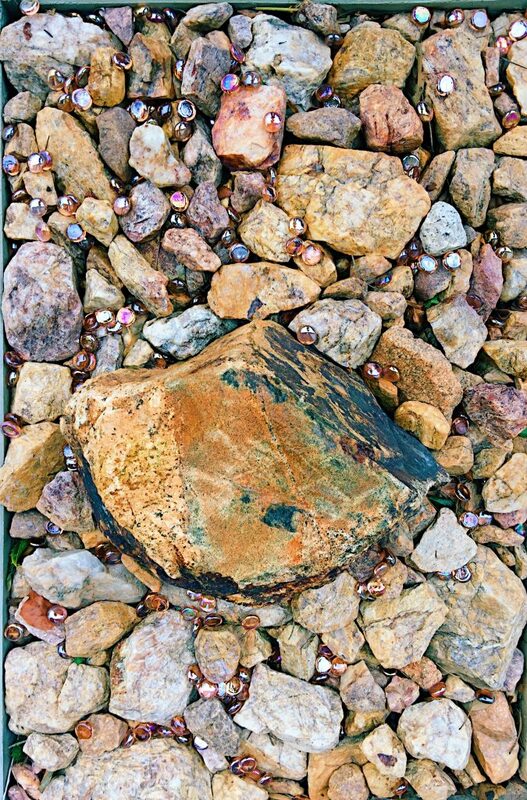 I love the pebbles in your rocks idea!! Sooo cute and fun. I’ll have to remember that for when I get a house someday! I think I would like a photo collage on your wall, you should go for it! 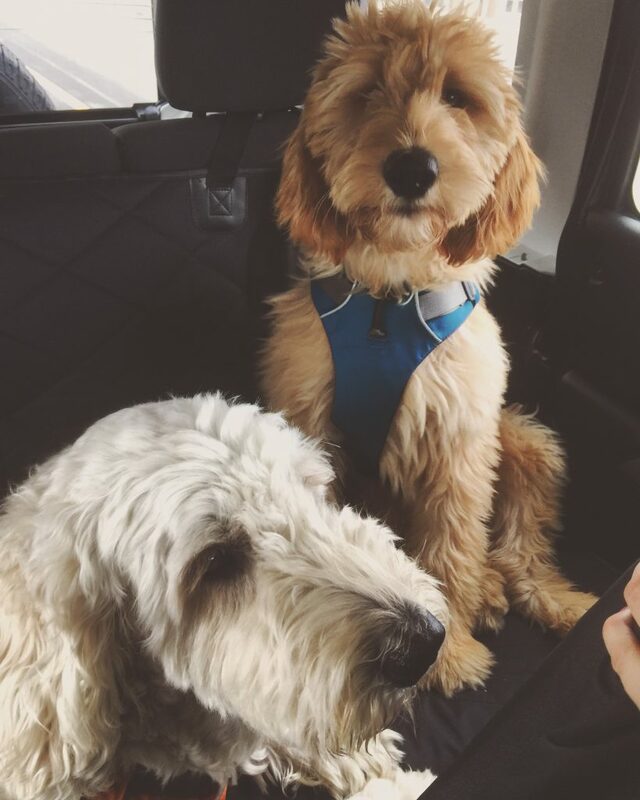 Ps I’m obsessed with golden doodles they are my dream dogs. I plan on getting one as soon as I’m done with pharmacy school ? Awww cute gift idea! Will you have snow this holiday season? I think I’ll play around with the wall! I am making my cinnamon rolls tomorrow!!! so fun to do!!! Your bathroom is goals! I can’t wait to see the finished product. Thank you!! I need to look. Maybe I can buy some cases! I think you should leave the mirror. It makes the room look bigger. Also how do you like you kitchen aid mixer? I’ve been thinking about getting one. And for non stick pans T-fal is a really good choice! I’ve had mine for 3 years and they’re still like new. I love my Kitchen Aid Mixer! I’ve used it for the past five years! Thanks so much for the pan recommendations! 1. At my parent’s house in the philly suburbs as always! 2. We go to my poppop’s nursing home for a light lunch, have dinner with my immediate family at home and then go to the candelit late night service at church. 3. A calendar for my dad, custom made with pictures of our family. I did it last year so it’s a new tradition, and even more special since my niece was born in 2016..so lots of cute pics! The only thing about moving the gold mirror above the fireplace is that it may be too busy with the t.v. and I think it’s a little too big for that space. I could always move the mirror upstairs in my bedroom too. It’ll be fun to play around with it. Hows the weather this christmas? 2) I will be going to the Denver Art Museum, they are having really fantastic Power of Costume exhibit this year that showcases all the costumes from the Star Wars trilogy. This is a new tradition! I will, of course, still be doing some of my normal Christmas Eve traditions like baking cookies for Christmas and walking down the river in Golden, CO to see the beautiful Christmas light display the put up every year. It is so magical! I just saw your recipe for your royal icing, I think I will be trying that this year, your icing always looks so great. Is this the same icing you use on your Halloween cookies as well? 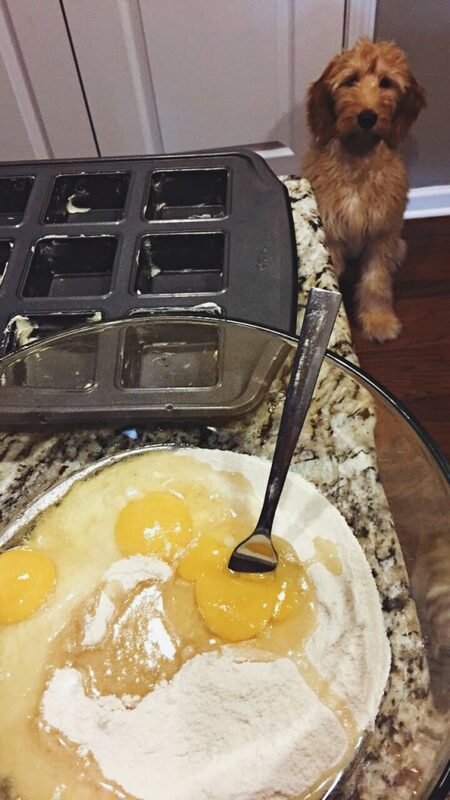 Is there a recipe on that blog post? 3) I am really excited for Aaron to open his present, I got him a GPS walkie talkie for his hunting trips. I think he might die! I am also excited to give my sister 222 diapers for my nephew, because every time I watch him she asks me to pick up a thing of diapers because she is out (insert rolling eye emoji here). **I can’t wait to hear how your Christmas turns out. Your home is beautiful and I am SO happy for you. 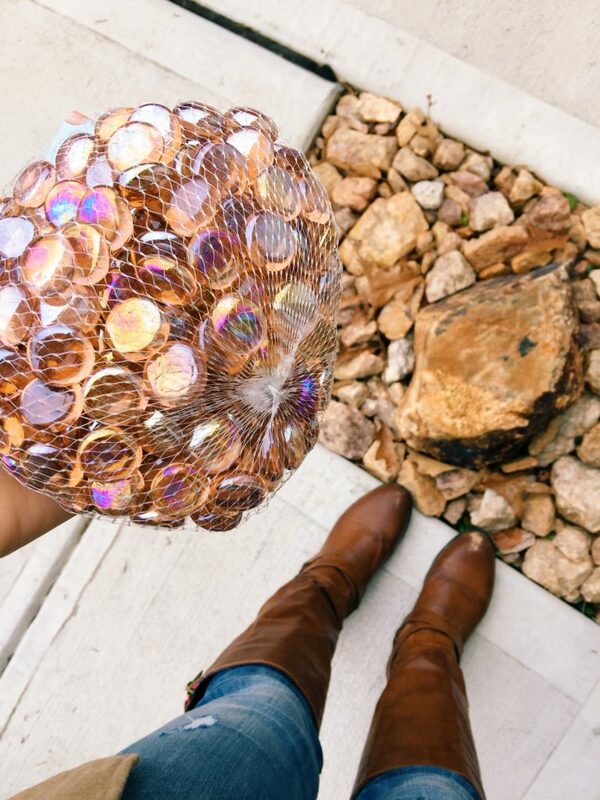 I am excited to see all your DIY projects!! That is so sweet. 🙂 I’m sure they love you to pieces. Sounds like a super fun and unique holiday! It is the same icing! You are such a good girlfriend! Cool gift! Can you please come decorate my house!!! You’re place is so cute and homey! Where is your couch from it looks so comfortable! I will for sure! 🙂 I had so much fun! That makeover was literally only $100! I think I have the same couch! I blame it for keeping me hostage when I fall asleep on it *nightly, when I should be sleeping in an actual bed ?? LOL YES!! I sleep on the couch more than my bed! It’s heaven! Congratulations on the new house! I do have a question from one coffee lover to another. 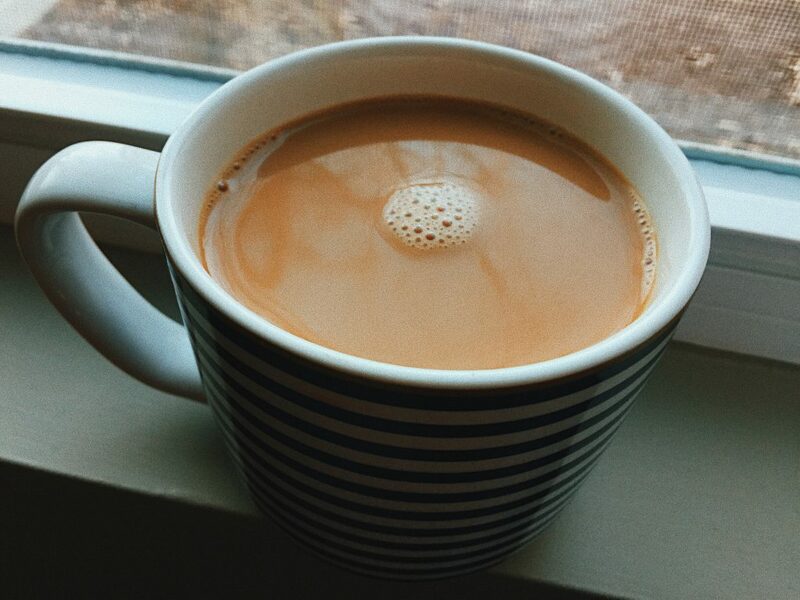 Do you use a keurig coffee maker or a regular coffee maker on a regular basis? Merry Christmas! I only use a Keurig when I’m at Kyles! I am a drip coffee gal 🙂 I love Seattles Best Medium/Dark coffee! I use 7 cups of water & 1/2 cup of grounds! 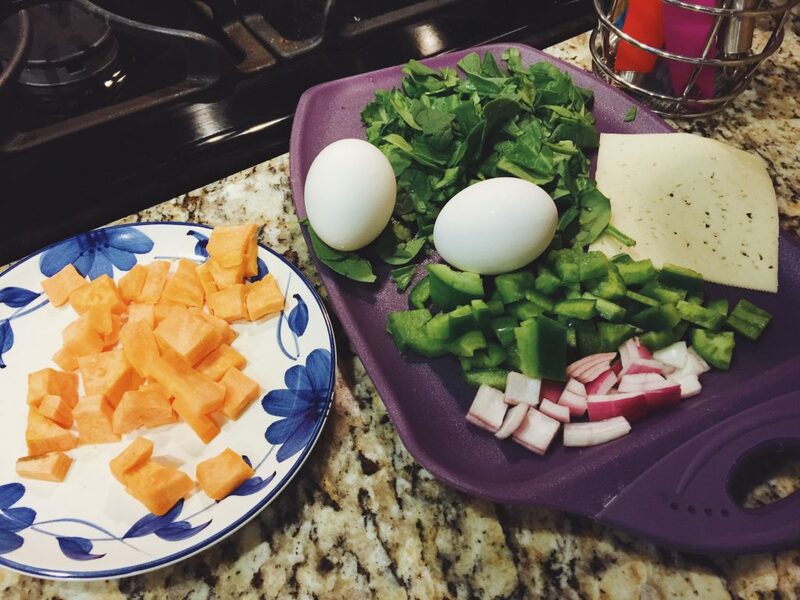 SO excited to try that egg scramble! Everyone comes to our house for Christmas, but I go to my grandparents’ in Greeenville on Christmas Eve! I can’t wait to give my dad the metal detector we bought him, he has been asking for one all year! I hope you have a wonderful Christmas! 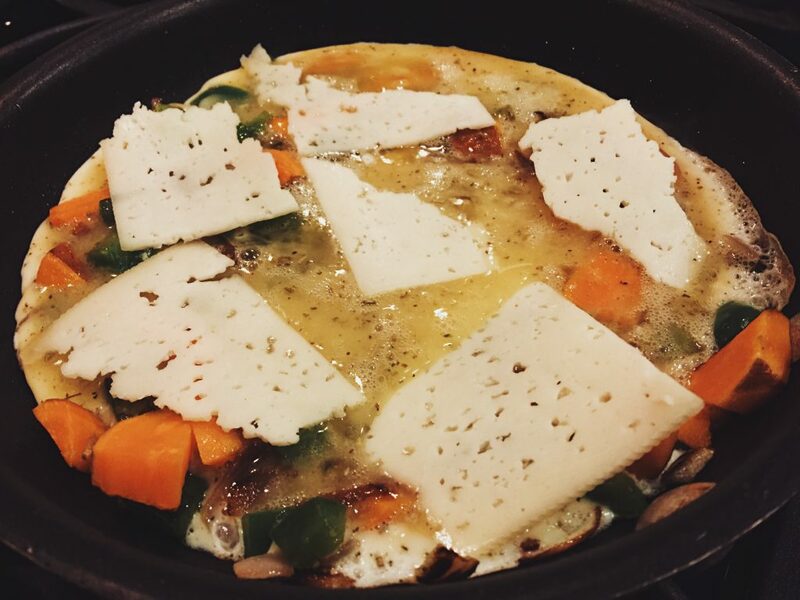 IT’S SO GOOD, especially with havarti cheese! You’re going to have so much fun with your grandparents! 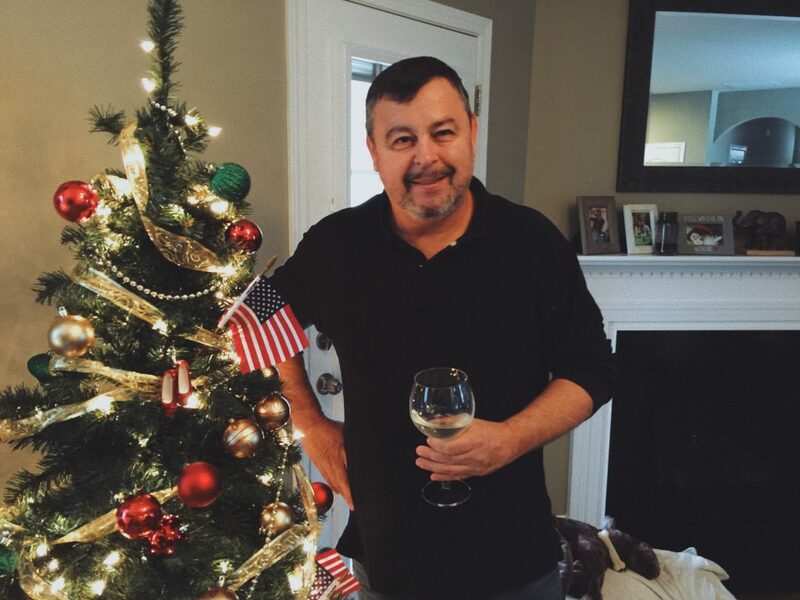 I gave my dad a metal defector one year and he LOVED IT! We took it to the beach! 1. I’m heading to KY to be with my parents & brother for Christmas! The way the cookie crumbles this year we have Friday & Monday off from work which is great! 2. Our Christmas Eve tradition is my favorite. We go to our favorite Chinese place for dinner, and usually split a bottle of plum wine, which I love because usually my parents drink Bourbon or nothing. Then we drive around & look at our favorite tacky Christmas lights before we change & head to “Midnight Mass” – that really starts at 11PM. 3. My family & I will exchange some small gifts. But honestly, other than that, I convince everyone else that we should opt out of exchanging presents, and usually people are cool with it. Even the Mr. and I. We’ll plan a fancy date night out sometime soon though as our gift to each other. So I’m excited for that! Definitely love the idea of a gallery wall versus the mirror behind the couch. And, any chance that coffee table was handmade by you // your dad? I absolutely love it! That is so great. You guys are going to have a fun Christmas and PLEASE PLEASE drive/fly safe!! I love that Christmas Eve tradition!! I am just like you! & we totally opted out for gifts! I got some stocking stuffers for my mom and dad but thats about it. That was handmade by my dad!! He does all my furniture. Happy Holidays and congrats on your new home! Christmas Eve will be spent with my family up in Pennsylvania and Christmas Day our families are coming to our home in West Virginia! Growing up, we always went to mass, then had a huge Christmas party at my Grandparent’s home, but most of my family lives in Arizona now, so we keep it low key! Mass, dinner, and we always drive around checking out our local towns Christmas lights! I’m surprising my parents and boyfriend with tickets to the Steeler game on New Years Day! No one has a clue! Merry Christmas Taralynn! Hope you and enjoy your new home with your family and boyfriend! 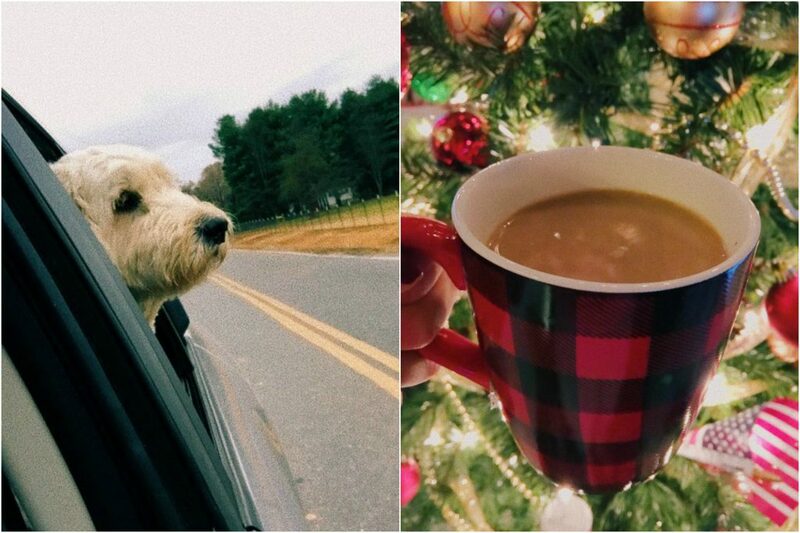 Sounds like you guys do the same as us on Christmas Eve! OMG!!! You’re like the best girlfriend ever! Merry Christmas to you!!!!! xo xo Please let me know how your boyfriend reacts! I love surprises! Merry Christmas to you and your loved ones Taralynn! 1. I’ll be spending the holidays all over Ottawa (Canada) with my family and my fiances family. We go to about 4 places total on Christmas Day, but it’s so much fun being able to see everyone. 2. Christmas Eve we always go to church with my grandparents, and then back to their house for dinner and stocking. My Nana made these GIANT human-child sized stocking when we were kids and she still fills them with treats for us, even though I’m in my late 20s! 3. I made my sister in law a Scrabble family names frame (not sure if I’m explaining that right). It’s her name and her husbands and their kids all lined up in a frame made with scrabble tiles and lined up scrabble style. The background is burlap and it’s a lovely white frame. I’m not a crafty person, so this was a big deal for me, haha. I hope you enjoy the holidays with your family and wish you a wonderful new year full of good health and happiness! Merry Christmas to you too Lauren!! That is such a crafty and thoughtful gift!! 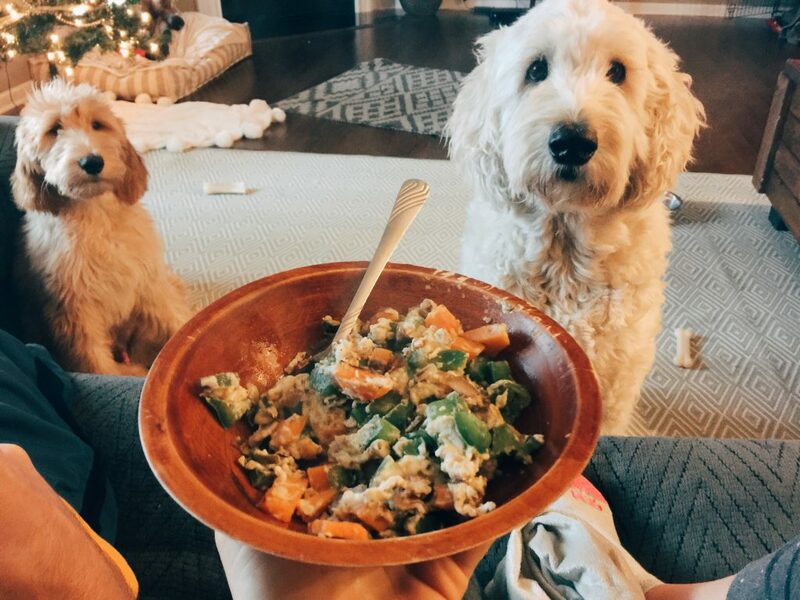 Recipe for the parmesan quinoa please! 🙂 Also OBSESSED with your choice of wall color with that golf-framed mirror. Christmas Eve will be with my dad’s side of the family, Christmas morning we open presents at our house with my inlaws and the immediate family. Christmas day is spent with my mom’s family. I can’t wait for my husband to open the engraved Westworld glass I bought him. I love the new look of the room after the wall painting. It’s so moody and cosy! Also, the salads you can get in the US make me so jealous. Hong Kong isn’t really a salad-eating city, so my store-bought ones are always so pitiful. My boyfriend and I set up a tiny budget Christmas gift challenge under $150HKD ($19USD, according to Google). I went to the grocery store and bought him tons of mango flavoured snacks like chocolates, biscuits, candies, jelly powder, canned mango pieces, drinks and mints because he loves mangoes! Really couldn’t think of any ideas, LOL. But I’m excited to give him the gift! Awww, but I bet you guys have some pretty tasty food over there! & thank you so much for the kind words about my home! I’ll be spending the holidays at home with my family. No place I’d rather be! Xmas eve is reserved for my boyfriend’s family & then we go home and watch White Christmas- my favorite movie! I NEED!!!! I wanted to wait until I found brand i liked! I know hers are good because my brother has them! Lol me and you both! !